Last week, I had the privilege of presenting at the first Office 365 Engage conference. Billed as a practical, no-marketing-content conference, and chaired by Tony Redmond, the conference offered a pretty impressive lineup of speakers from across the Office 365 world, mostly from Europe. One big drawback to the way that Microsoft and Penton have organized their respective conferences is that it’s often difficult to get European experts and MVPs here to speak, so I was looking forward to seeing some fresh material presented by people I don’t usually get to hear from, and I was not disappointed. I arrived midday Tuesday after changing planes in Reykjavik (more on that later). A quick train ride got me to the Haarlem Centraal station, after which I grabbed an Uber to the hotel. 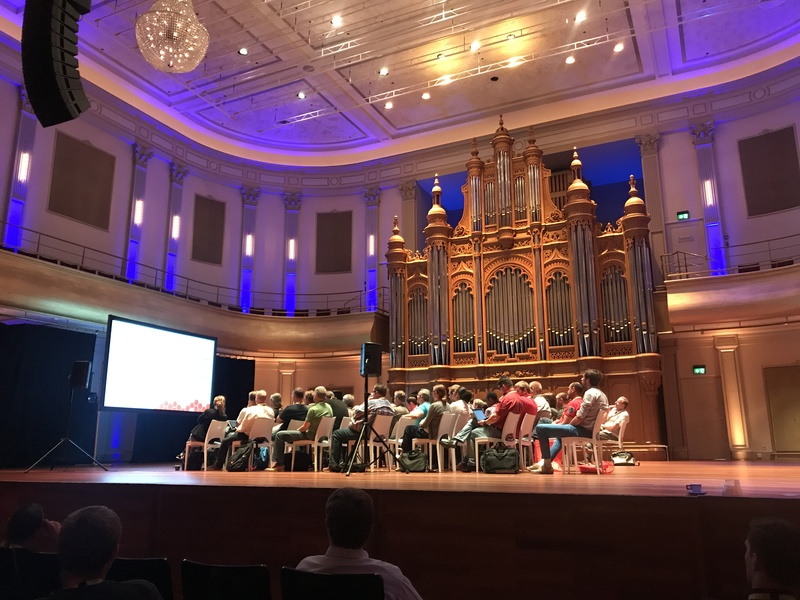 The conference was booked into the Philharmonie Haarlem, and I must say it was the nicest conference venue I’ve ever been in– a far cry from the typical US conference facilities located in echoing, soulless conference centers or noisy, smoky Vegas hotels. 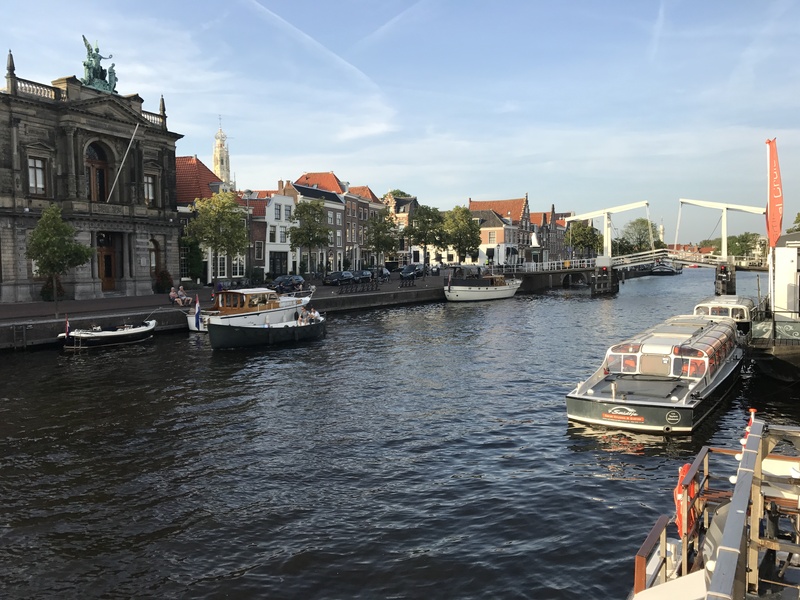 The location was excellent as well– Haarlem is a beautiful city and quite walkable. The conference hotel was a mere 3-minute walk from the Philharmonie and the area contained a wealth of restaurants and shops. After I got registered, I wandered around talking to attendees and speakers. My first session (on monitoring Office 365, big surprise!) wasn’t until Wednesday morning so I got to drop in on a couple of sessions, which was nice. Unfortunately, I spent most of my time Tuesday either working on my slides and demos or on the phone with folks back in the USA– that’s the big downside to being in Europe. Tuesday night I met a group of MVPs for dinner, at a Mexican restaurant, of all places. Wednesday I had my monitoring session in the morning, along with more work on my third session’s slides. I got some good attendee questions that I’ll use to make the presentation better for the next time– as Microsoft is always changing the monitoring and reporting functionality in Office 365, this is definitely an evolving area. In the afternoon, I was able to go to Tiago Costa’s session on Office Graph development, which I found quite valuable. Wednesday night the organizers had set up a canal cruise for the speakers, which was a lovely treat– Haarlem looks even better from the water. Obligatory windmill photo. This was the only one I saw the entire trip. Thursday was a big day. I had two sessions: one on Skype Meeting Broadcast and one on Windows Information Protection. Fellow MVP Brian Reid was kind enough to help salvage my demo; I filed a support ticket with Microsoft about an hour before my session because my tenant didn’t work, but his did. We even got to demonstrate the real-time automated closed captioning feature that Skype Meeting Broadcast now includes, which resulted in quite a few laughs from the audience. It works surprisingly well, better with Brian’s English accent than my own American one. Then it was back to the speaker lounge for still more work on my information protection slides, which I delivered to a curious audience without a hitch. (I had a great side conversation with a lady who works for, shall we say, an allied power and had a lot of interesting questions about ways to use the Information Protection features in what might euphemistically be called a nuclear bunker.) The afternoon sessions were accompanied by a loud, heavy thunderstorm that wouldn’t be out of place in Alabama– I think some of the locals were a little surprised by its ferocity. The rain had cleared and left the air cool and clear afterwards, perfect for the closing session, after which I jumped in a taxi to get to Schiphol for my flight on to Reykjavik. A quick note on logistics: the venue’s Internet connection worked well for nearly everyone, seating was comfortable and plentiful, and the snacks, coffee, and lunches were good. Overall the logistics were far better than average, especially for a freshman offering. I believe that reflects the experience of the event team, all of whom have put on many such similar events in the past. Overall, this was a solid first-year conference. With only a couple hundred attendees, it preserves the small-group feel that was formerly so attractive about first MEC and then Connections, but with a great deal of attention paid to ensuring that the content was relevant, unique, and practical. I’m looking forward to next year’s version! I recently had a really interesting cross-country trip. It featured virgins, dirt, avian invaders, and tractors. 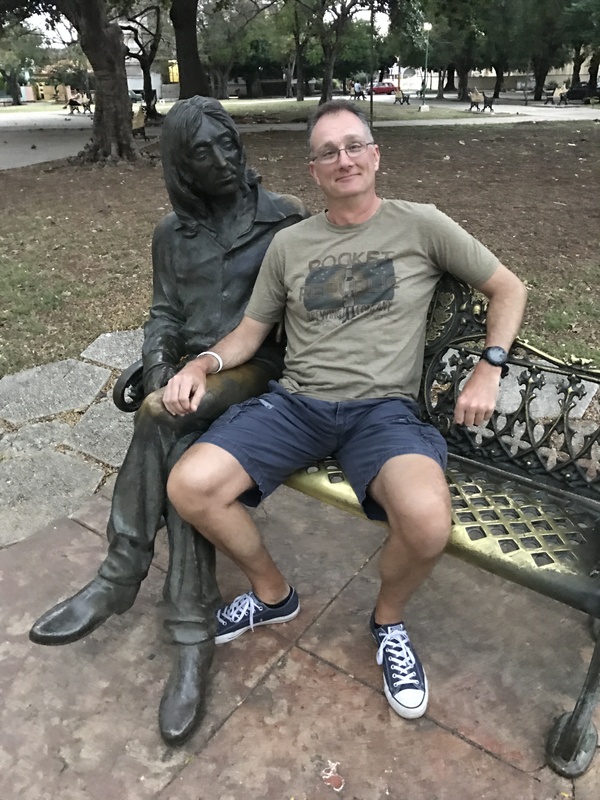 Some local friends talked me into running the American Odyssey relay race: just under 200 miles from Gettysburg to Washington, DC, over two days. (Look for a race report in the near future.) Some of my teammates were flying commercial, and some were driving, but I found three hardy souls who volunteered to go with me. Jim’s a Navy officer who’s used to airplanes of all sizes, but neither Rese nor Melissa had flown in a small airplane before… so they’re the virgins in this story. I’d planned to fly from Decatur to New River (PSK), fuel up with avgas and diet Coke, and then fly into College Park, MD (CGS). This would allow me to use my fancy secret code to fly into the Washington DC ring of restricted airspace. However, because we were staying in Harpers Ferry, it didn’t make sense to fly 60+ miles to the east just so we could have extra drive time going back to Harpers Ferry. I decided to go into Martinsburg (MRB) instead to avoid the extra driving. We departed on schedule, with about 1500′ ceilings leaving Decatur. A front was on its way so my goal was to get us to our destination before the weather got bad. 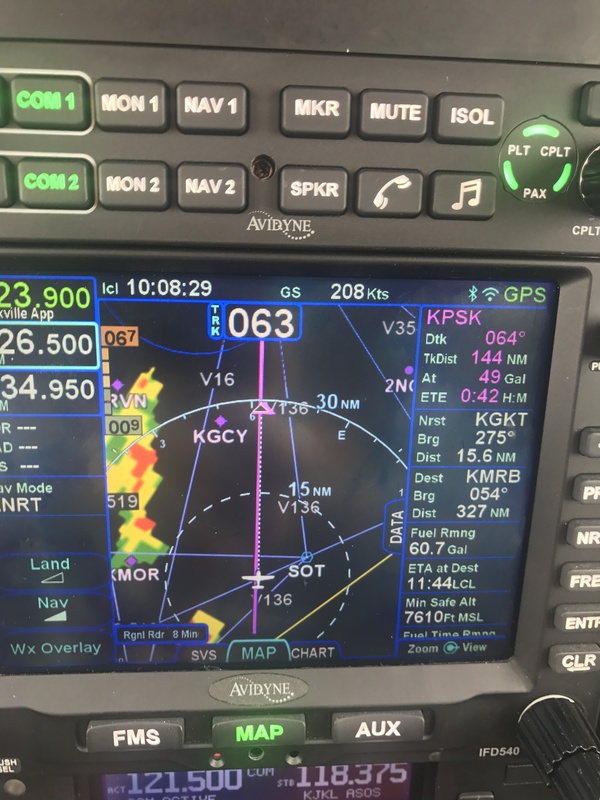 We benefited from an epic tailwind– my normal cruise speed is about 135kts but I was seeing over 200kts for a good part of the first leg. Unfortunately, with wind comes bumps.. so one of our crew (I’m not saying who) needed to use a barf bag. No major damage, thankfully, either to the victim or the airplane. 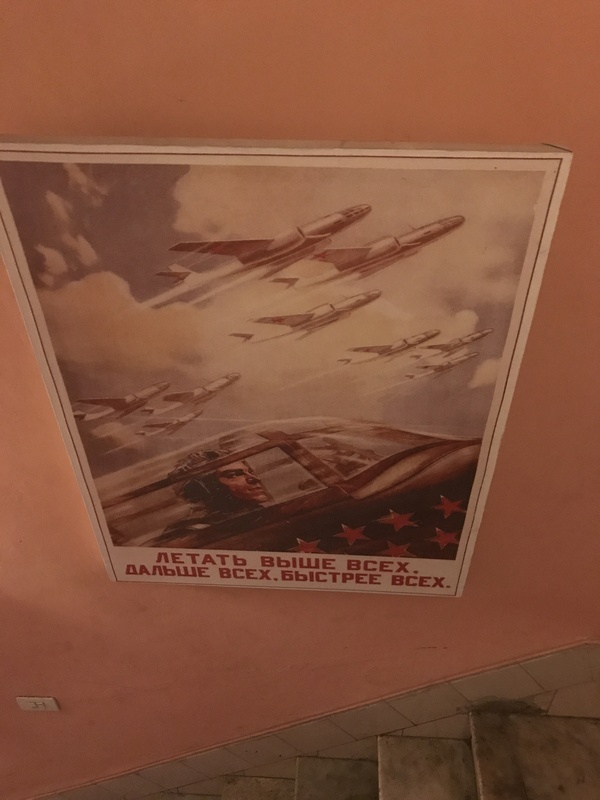 Apart from that, the rest of the flight was uneventful– a quick stop at PSK for fuel and diet Coke and we were on our way. Potomac Approach made me fly the RNAV 26 approach even though the weather was VFR. Martinsburg is home to the 167th Airlift Wing, so there were a bunch of big gray C-17s on the ramp. Always a fun sight. Aero-Smith, the local FBO, had prearranged a rental van. It was waiting, so we loaded up and off we went. The next couple days were a blur– I had a fantastic time at the race. All too soon, though, it was time to head back home, so I planned our flight to follow roughly the same route. While the big front had passed through, we were still forecast to have 20+ knots of headwind, so I tried to choose a more southerly route to reduce the wind penalty (spoiler: that didn’t work). I’d planned the first leg from Martinsburg to Ashe County, NC, then home. We got to Martinsburg safely and turned in the van. The FBO lineman offered me a box of rubber gloves. “We saw a lot of birds on your airplane,” he said. “There’s probably some poop on it.” I’ll take “things you don’t want to hear at the airport” for $200, Alex! I walked out to the plane, which they’d parked on the far edge of the (empty) parking area. 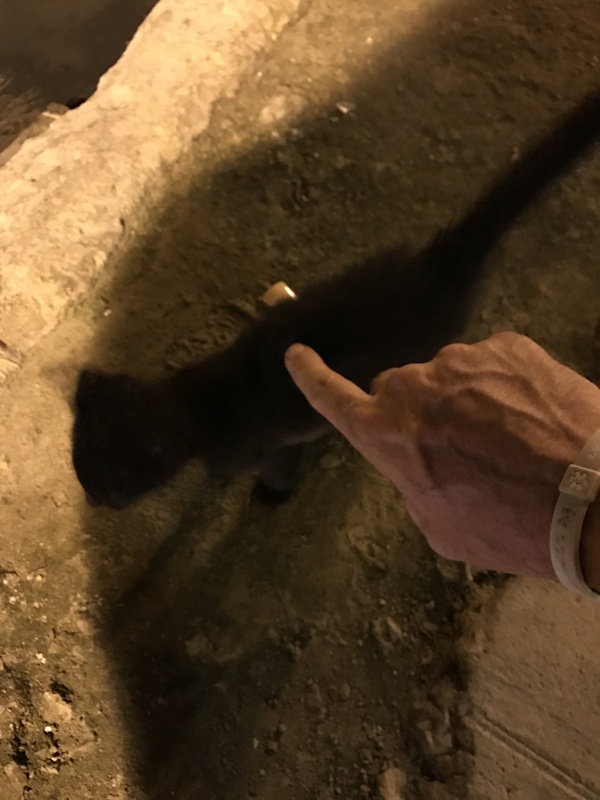 I saw a few poop spots and used a gloved hand to remove them. Now, this next part is relevant: I usually start my walkaround by turning on the master switch, existing the forward passenger door, and walking back down the right side of the plane, around the tail, and up the left side– finishing at the engine. 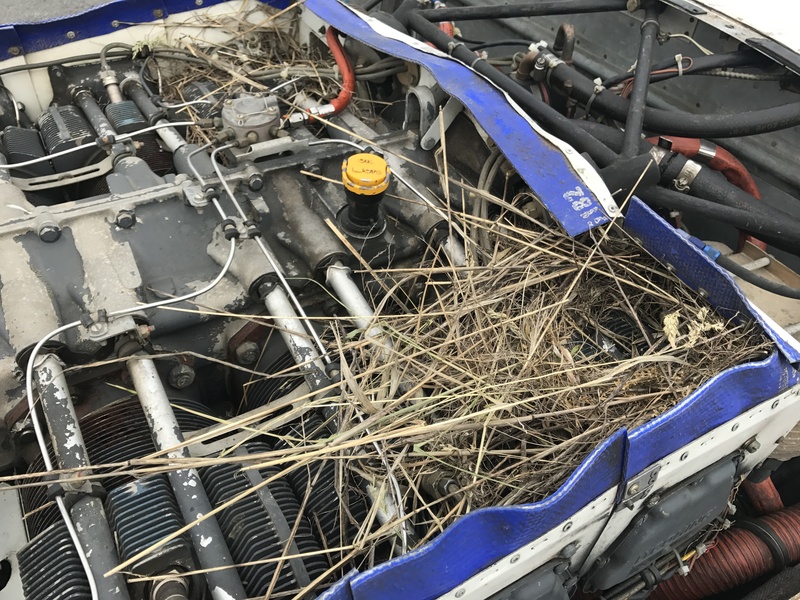 That’s what I did… except that when I got to the engine, I noticed what looked like a few pieces of grass sticking out. That certainly wasn’t there when I parked the plane, so I poked a flashlight into the front of the cowling and was surprised to see some more grass. That led me to remove the upper cowling, whereupon I found this (click it to see the detail). Yep. In two and a half days, the forces of evil invaded my cowling and built two large, flammable nests. I started pulling out handfuls of grass and twigs, and the other three came to help. All this action attracted the attention of the FBO staff, and they brought us a handheld leaf blower. 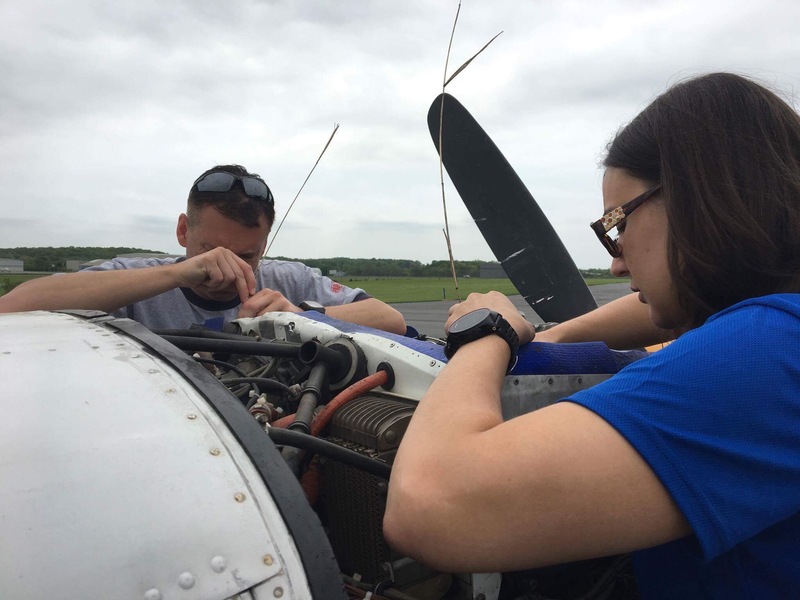 Once that was finally done, I wanted to run the engine with the cowling off, whereupon I discovered a failed cell in the battery.. so the plane wouldn’t start. This was not popular with my passengers. Or with me, for that matter. The FBO staff was very reluctant to help start the plane. They claimed not to have a ground power unit, but I eventually talked them into bringing their tow tractor out so I could use my jumper cable. 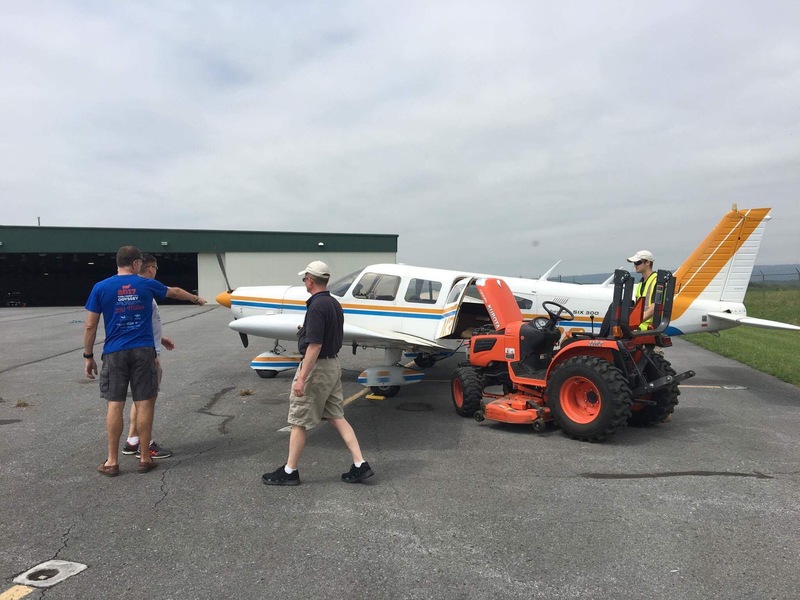 The problem with this cable is that after the plane starts, you have to unplug it, and the FBO guys didn’t want to do it “for liability reasons.” Thankfully Jim wasn’t a big baby like they were, and he volunteered to pull the cable after engine start. We deployed the tractor, got everything hooked up, and the engine immediately started up. Once we got up to altitude, we got a 1-2 punch from the headwinds: it was bumpy, and we were only making about 105kts over the ground– so less than half of our groundspeed on the way out. After a little fiddling, I got permission to climb from 8000′ to 10000′; as we slowly climbed, we got bounced around quite a bit. To make things worse, the wind was even stronger at 10000′, so we went back down to 8000. It was a steady parade of mountain waves, something I hadn’t spent any time dealing with before. Frankly I didn’t much care for them. There was a good-sized line of storms stretching from south to north moving through Mississippi when we left. Our original plan was to get home before it arrived, but due to our de-birding time, there was no way we were going to make that. As we flew, it became clear that the headwinds were going to prevent us from making our alternate at Winchester, so I decided to stop in Chattanooga, which has rental cars, nearby hotels, and food.. just in case. We landed and found the ramp crowded with more expensive airplanes that had obviously stopped for the weather as well. Luckily the FBO had one crew car remaining, so we headed out to look for dinner and wait for the storm to pass. The city got roughly 1/4″ of rain in the hour we were at dinner, but it had tapered off to a light drizzle by the time we got ready to depart. I pored over the radar and it looked decent if we flew a little to the northwest, more towards Winchester, and then turned south, so that is what I planned for. 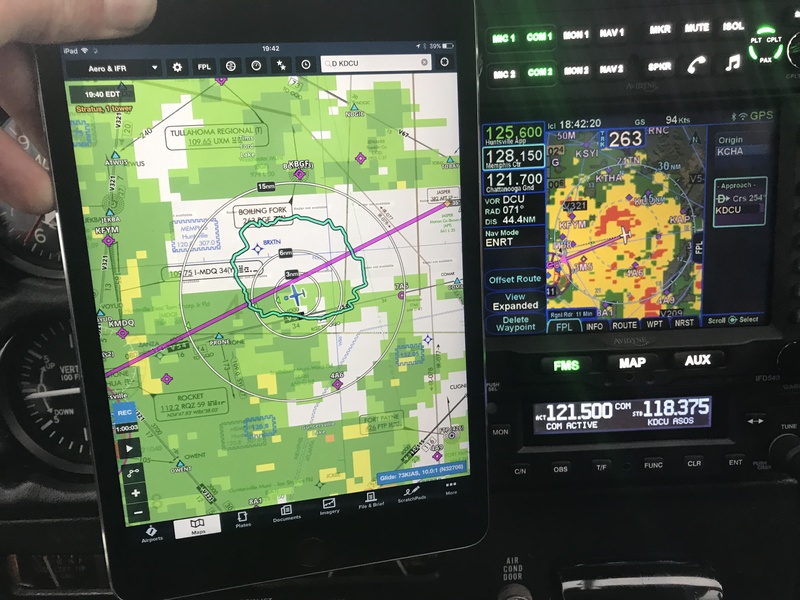 Once airborne, I quickly saw that the radar depictions didn’t give the full picture– they showed rain, all right, but the clouds were well above our altitude, so for most of the flight we flew through falling rain but still had decent visibility. The picture below shows what the radar depicted (they’re different, but that’s a topic for another post). After an uneventful trip, with mostly smooth air, we landed at Decatur, packed up, and headed home. 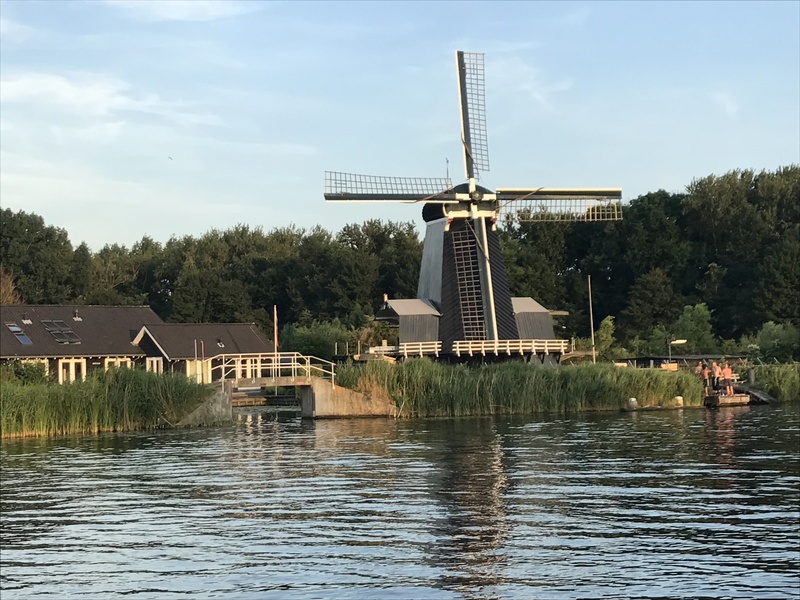 I’m delighted to announce that I’ll be presenting 3 sessions at the new Office 365 Engage conference, 19-22 June in Haarlem, The Netherlands. With the death of TechEd and the product-specific conferences, Microsoft has more or less abandoned the broad conference market in Europe. They’ve hosted smaller, more focused events covering specific technologies in individual countries, but customers who want a broader perspective, or any degree of engagement with non-Microsoft speakers and experts, have had to come to the US-based conferences. Now the UnityConnect team, led by the redoubtable Tony Redmond, are hosting a full-spectrum event focused on all aspects of Office 365, including Teams, Planner, and Groups– not just the more established Exchange/SharePoint/Skype trinity (although there is plenty of that content, too). The speaker lineup is stellar as well; in fact, I wonder how I got in. Attendees will have the opportunity to hear from Michael Van Hybrid Horenbeeck, Steve Goodman, Michel de Rooij, Sigi Jagott, Brian Reid, Alan Byrne, and a host of other MVPs and Microsoft technology experts. The session catalog is pretty impressive. The Ins and Outs of Monitoring Office 365 covers the fundamentals of monitoring such a complex service environment. Although it may be tempting to just say “let Microsoft worry about it,” the fact is that it’s critical to keep tabs on the health and integrity of the service and all its components, as your users depend on it and probably won’t accept “it was Microsoft’s fault” as an answer. The session will cover the basic tools that Microsoft provides and analyze how they compare to the monitoring needs imposed by dependence on a hybrid cloud service. Windows Information Protection and Azure Rights Managment: Better Together. Normally I hate the phrase “better together” because it is Microsoft-speak for “buy more of our products,” but in this case it’s apropos. WIP and AzureRM work quite well together, and the combination enables some interesting data protection scenarios that I’ll cover here in depth. Like a Megaphone: Skype Meeting Broadcast will cover the little-known, but quite useful, Skype Meeting Broadcast feature. As its name implies, Broadcast lets you take an ordinary Skype for Business meeting and scale it out to up to 10,000 attendees… but there are some caveats you’ll need to know about to use it effectively. There’s a full slate of pre-conference workshops, receptions, and so on as well. Perhaps I can persuade Tony to do a live episode of Office 365 Exposed while we’re there– we shall see. Come join me! The conference team has given me a discount code, SPRPR469, which will save you 10% on the registration cost. I hope to see you there! Day 7, and time to go home. Logistically, this was a pretty straightforward process, but cognitively, it was deeply weird. Shortly thereafter, two dudes in a stake-bed truck showed up. We loaded up the luggage, and off we went. It took about 35min to drive from the apartment to the airport. I was much more aware of my surroundings than I had been on the inbound drive, so I noticed more of the details as we moved between areas of the city. 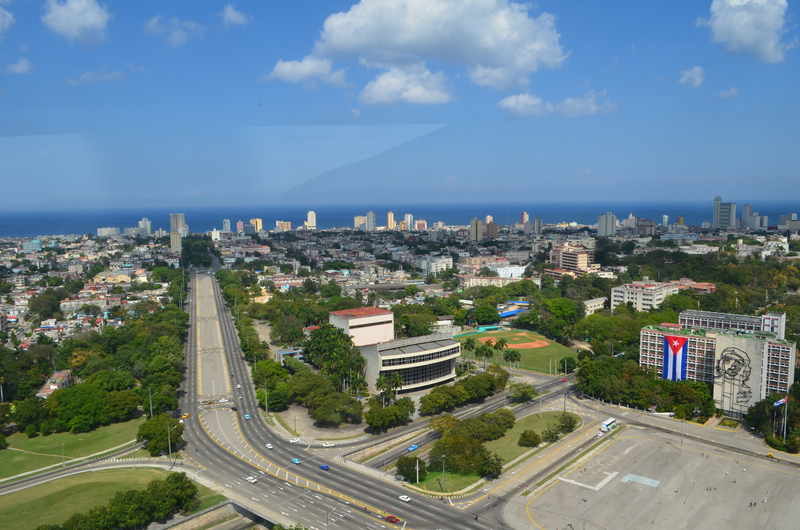 Apparently there is very little zoning law in Cuba– it reminded me of Houston in the way that you’d see residential, commercial, and heavy industrial space cheek by jowl. 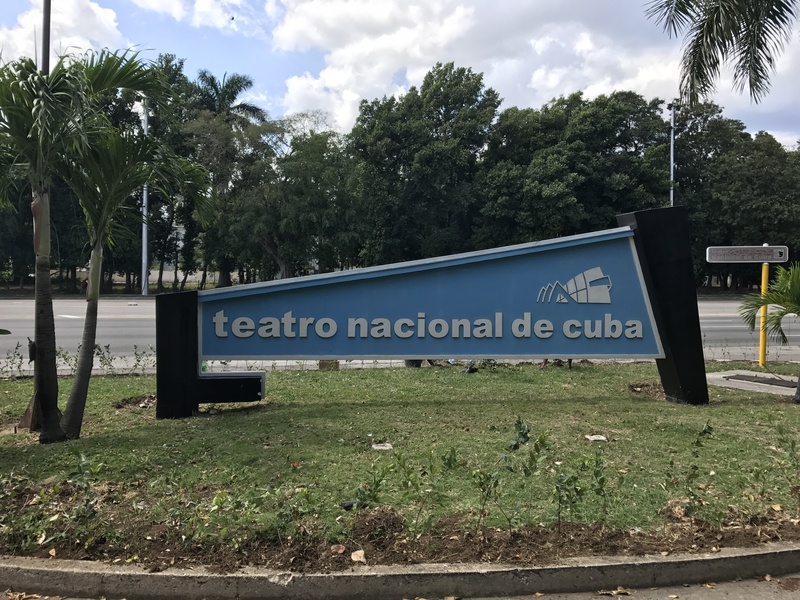 The typical Cuban mix of ugly Cold War-era buildings, graceful but crumbling older buildings, and improvised vehicles and structures held my attention throughout the drive. Now, here’s the thing about the airport: it’s like every other airport you’ve been to, except it isn’t. 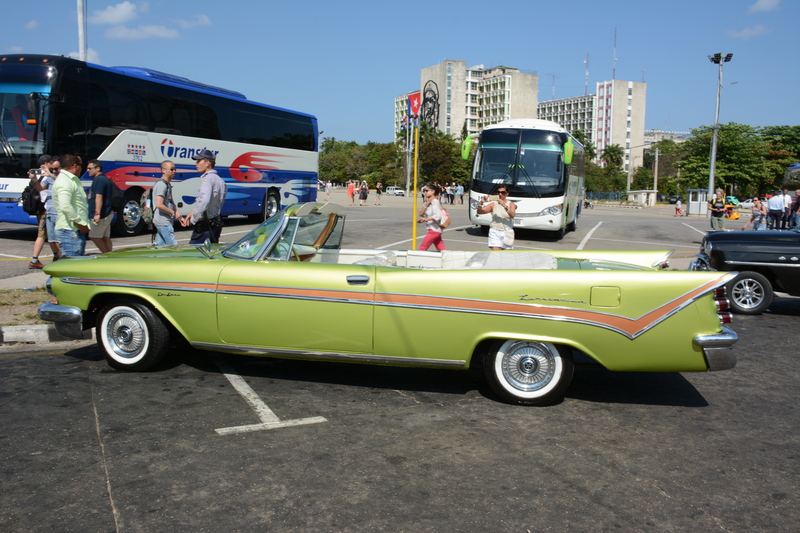 For example, there are ticket counters for the various airlines that serve Havana. The Delta counter has the same Sky Priority signs and so on that you’d see in Europe or the US. But the ticket agent didn’t want to hassle with making the computer accept the $150 bike fee that Delta normally charges, so, with a casual wave, we were beckoned around the corner to the freight elevator and our bikes flew free. Of course, there’s no online checkin (at least for Delta), nor is there any wifi on the land side of the terminal… although there are pay phones, something I haven’t seen at a US airport in ages. The basic workflow is the same as at US airports: check in, drop off your bags, go through security and immigration, and go to the gate. The immigration part is interesting because you are required to turn in the second half of your tourist card. Hypothetically speaking, if you lost it, you could be detained for further questioning or just hassled, unless a bored and irritated immigration agent decided to let you pass without it… hypothetically. Immediately past immigration, the first thing you come to on the air side is the duty free shop. It was packed. No surprise, since the prices for rum and coffee are set by the government and identical to what you’d pay out in town. We all loaded up with more rum and coffee; I think Warren also bought some more cigars. The name of our game overall was “spend all your CUC” since there’s no feasible way to change it back in the US. There is a cadeca on the air side, along with a row of small shops (kiosks, really) selling random crap– a far cry from the typical excess of US airport shops. There are two places to buy food– a small coffee shop downstairs and a weird sort of hamburger place in the main concourse. The gates, chairs, and so on all looked essentially the same as in a US airport, but the mix of airlines serving the airport is very different than what you’re probably used to. Aeroflot and Air China are both prominent, for example (I really wanted to take a picture with an Aeroflot flight crew but they were gone before we got to the gate). I had a ham sandwich at the coffee shop, bought some sodas, and settled in with the boys to wait for our flight. There’s (government) wifi in the terminal, so that helped kill some time, but I spent most of it people watching. The rest of the trip, to be honest, was anticlimax. 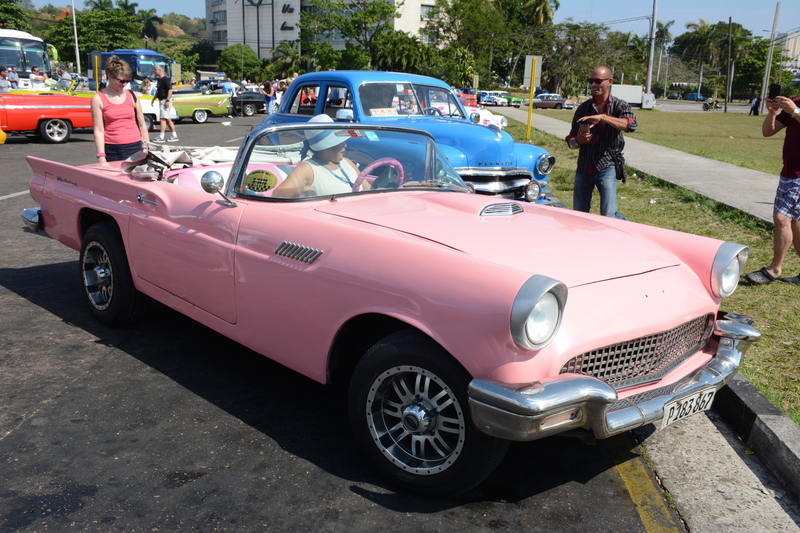 Being on a Delta airplane in Havana is just like being on one in Houston, Heathrow, Huntsville. 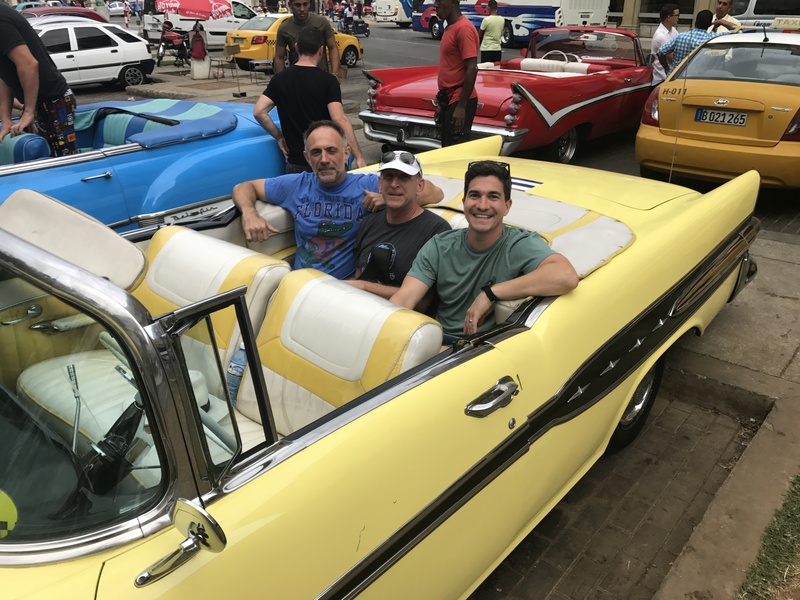 Lance and I got upgraded so we immediately asked for Diet Coke– something that just doesn’t exist in Cuba. Our flight was uneventful, the in-flight wifi worked flawlessly, and soon enough, we were touching down in Atlanta. I had previously signed up for Global Entry and it was magnificent– a quick stop at the kiosk and I was through customs in about 2 minutes total. We all had to do the bag drag to get our bikes and checked bags (most of which had serious quantities of liquor and coffee therein) to the drop off. After that, it was just like every other time I’ve changed planes in Atlanta (well, except that Tony immediately started hunting Pokémon). I had a turkey burger, walked the concourse a few times, and happily boarded our homebound flight. Teri and Theresa met us at the airport, and we happily chatted as we waited for our luggage. Once it arrived, Lance gave me a ride home, I dragged all my crap inside, and that was that… except for Pancake spending the next two hours dogging my heels and/or leaving cat hair on every item I’d brought back. The unpacking and general recovery took me the next few days; I think I’ve put everything where it belongs. Two notes I forgot in my day 5 writeup: first, we gave Anita, our housekeeper, a set of All-Clad pots we’d brought as a gift. Y’all, she cried because she was so happy. Something that everyone reading this blog takes for granted was an incredible and unexpected gift to her. We also gave her around 20 lbs of assorted travel size toiletries: shampoo, deodorant, and so on. Second, in a related note, we’d asked Anita if there were any good bars in the neighborhood. She told us about Industria 8, so we went there after dinner, arriving about 945. It was completely deserted, and at 10 (when the DJ arrived and started playing music), it stayed that way. Take from that what you will. 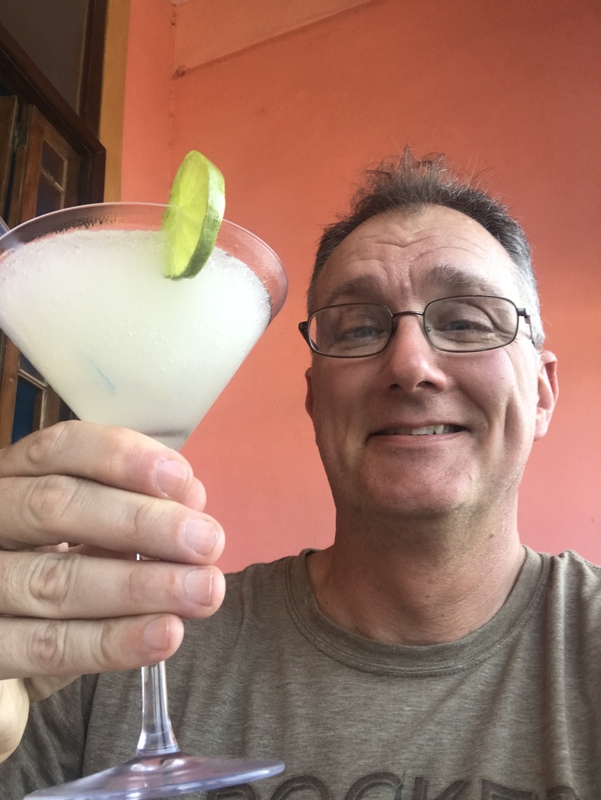 The drink below is called an “Industria 8” and Lance described it as tasting like vodka plus Crest toothpaste– it was the most memorable part of our visit. Now, on to day 6. 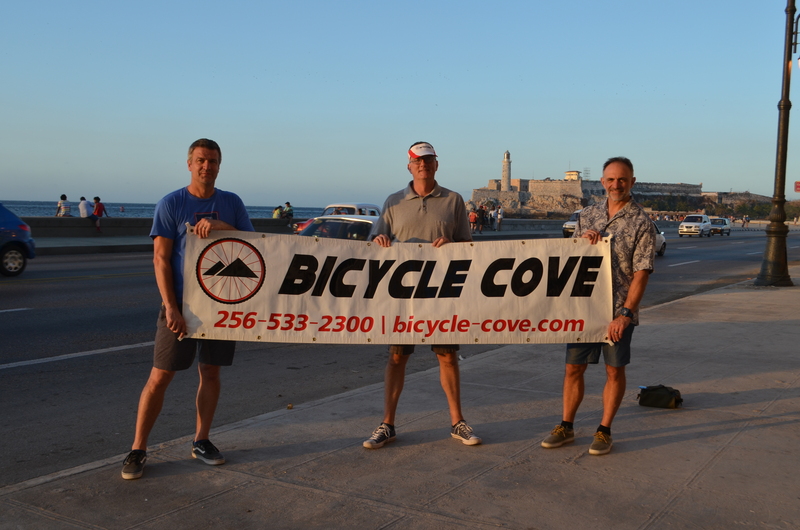 Day 6 should be titled “my favorite day.” I woke up feeling chipper and well rested, in part because I knew our plan was a leisurely bike ride on the Malecón with plenty of stops for picture taking. 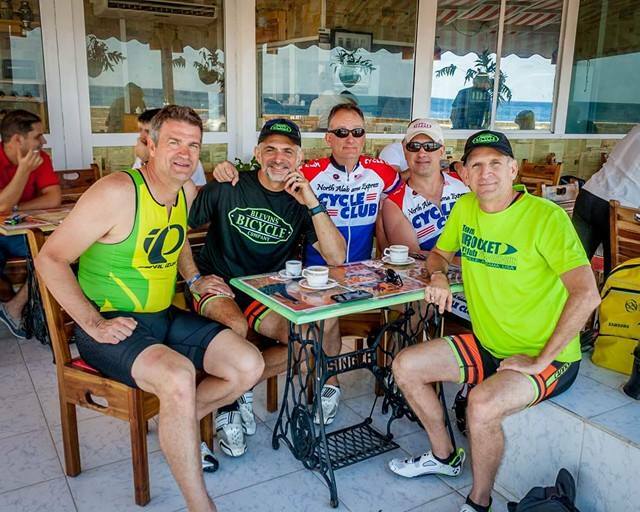 We all got kitted up and assembled on the street for our ride. Riding on San Lázaro is a little tricky because it’s narrow and there are usually cars parked on both sides, plus there are several cross streets without signals or stop signs. We launched and I almost immediately had to stop for oncoming traffic– at which point I fell over. Humbling, since that was the only time anyone fell over while clipped in the entire trip.. but it was minor and gave my buds a good opportunity to hassle me for the rest of the day. 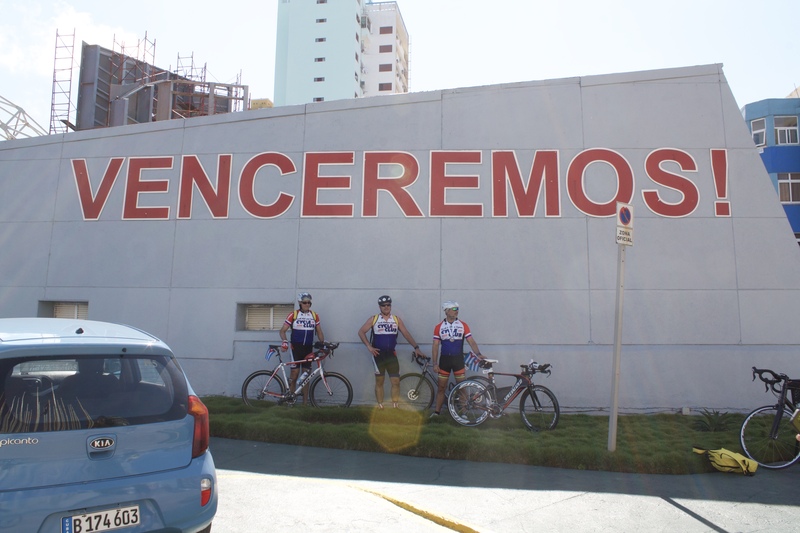 Our plan was to ride out to nearly the end of the Malecón, take some pictures, and then work our way back, stopping at various photo opportunities. Lance let me ride his beautiful Lynskey, which he hand-built using his preferred components. Wow. It was so much smoother and responsive than my Domane 2 that I now want one, so thanks for that. We rode past the same restaurant, Cafe Bohemio, that we’d previously seen while driving and running by, and Lance noticed a couple sitting on the patio with a camera. They took our picture, so after passing by we circled back to eat breakfast there (and ask them for a copy of the picture, which they graciously provided). The first step, of course, was to order coffee. Note the prices shown in both CUC (“tourist money”) and CUP (moneda naciónal). I ordered a cafe Caprichoso, which was the best single cup of coffee I’ve ever had in my life. The ham, egg, and cheese croissant I ordered was equally good, but I didn’t find that out for nearly an hour while we waited for the food. Luckily we had plenty to talk about while we waited. After breakfast, we set out for part 2 of our ride. 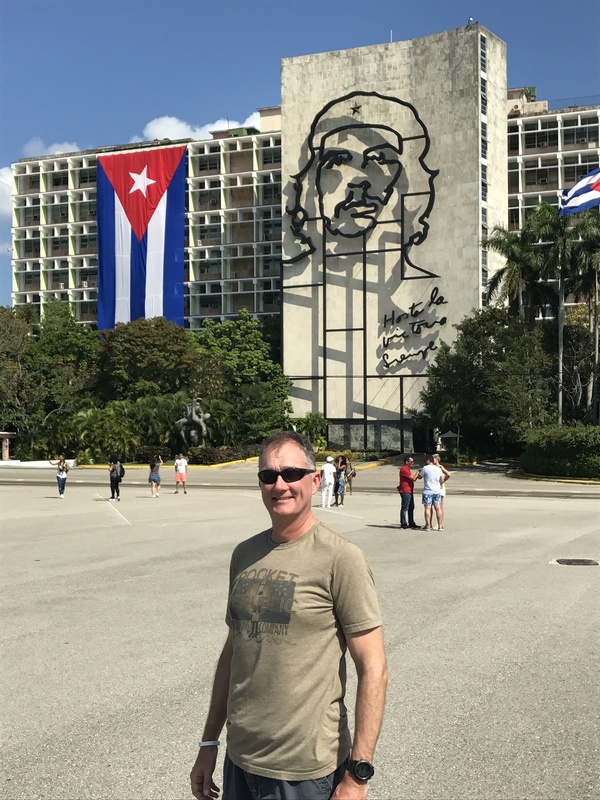 This time we stopped at several monuments, plus an open-air flea market where I got some nifty souvenirs: puzzle boxes for Matt and Jack, a backpack for Tom, and a Havana Club-logoed apron for myself. 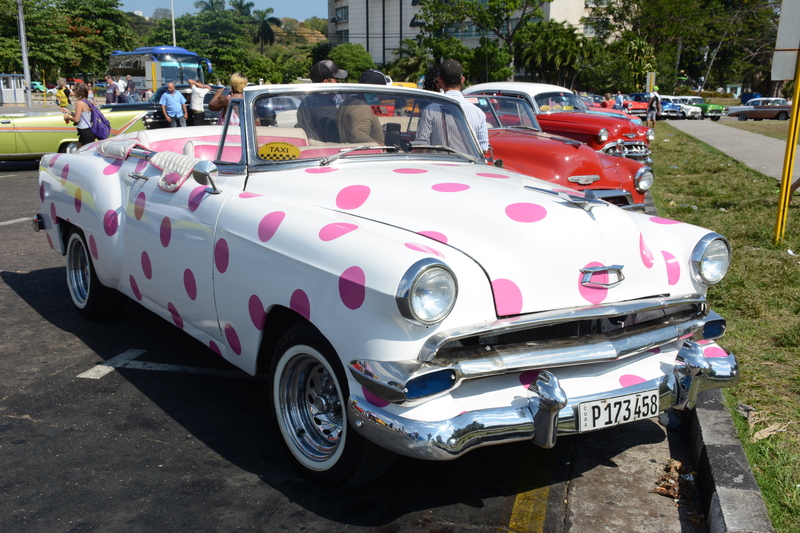 Cuba is not a souvenir place; we didn’t see a great deal of variety between different markets. 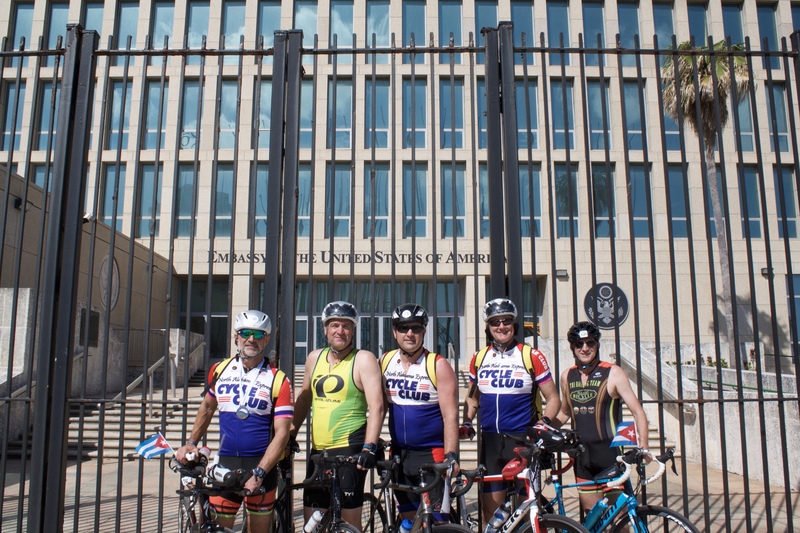 Perhaps the most interesting stop was at the gates of the US embassy in Havana, a terribly ugly building that was maintained by the Swiss until 2015, when it was reopened as the US embassy. 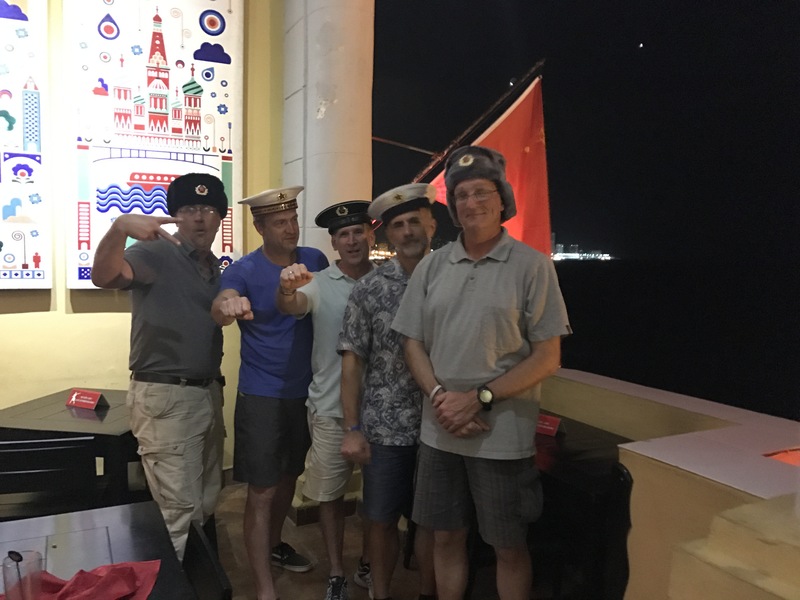 Sadly, there are no Marine security guards outside, although we did meet a nice gentleman from Syracuse who volunteered to take our picture. 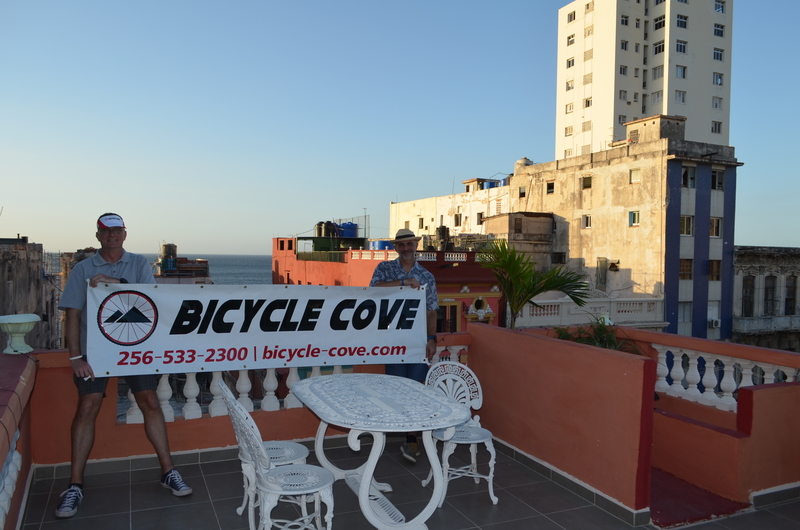 After the ride, we headed back to the apartment to disassemble and pack up the bikes. Once again, I owe a great debt of thanks to Lance for being our on-call bike mechanic. 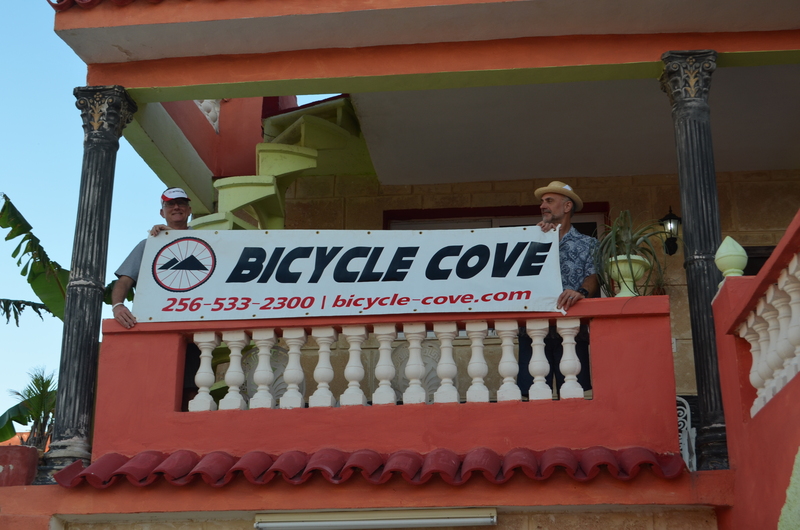 He had all the bikes disassembled and packed up within about 90 minutes, while the rest of us were showering and packing the rest of our stuff. 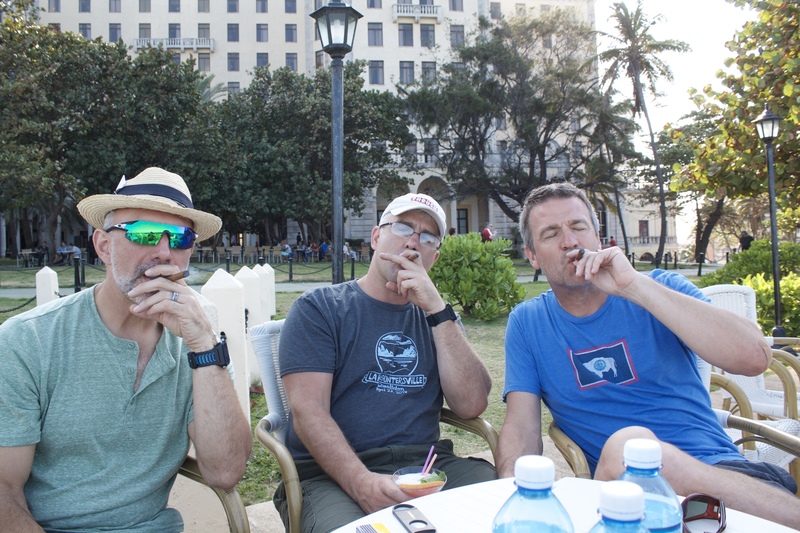 The afternoon schedule called for us to go back to Hotel Naciónal for a rite of passage: smoking a real Cuban cigar, while in Cuba. First, of course, we needed to eat, on the theory that such a fancy hotel would have good bar food. They did, on condition that you liked ham and cheese sandwiches (with or without pickles): that’s all they offer. When I say “all,” that’s what I mean: no sides, just sandwiches. One thing about the National: their patio service is exceptionally slow, even by Cuban standards. Once we finally finished our food, we went back inside to the cigar shop, conveniently located right next to the rum shop, and bumbled around. None of us are cigar smokers, so we depended on the two very pleasant sales ladies to help us pick out cigars to take home. An old man was hand-rolling cigars in the shop lobby. This was a surprisingly interesting process to watch, although he was too busy rolling (and, I suspect, too hard of hearing and/or incredulous at our poor Spanish) to answer our questions. We bought our cigars, plus some rum (more on that later), and, suitably armed, headed out to the back patio of the hotel near the water. Now, a confession: I have never smoked anything in my life. I couldn’t get my cigar lit until one of the guys borrowed a torch from another smoker. Then when I did get it lit, I didn’t really know what to do with it. The others were not a whole lot better off. 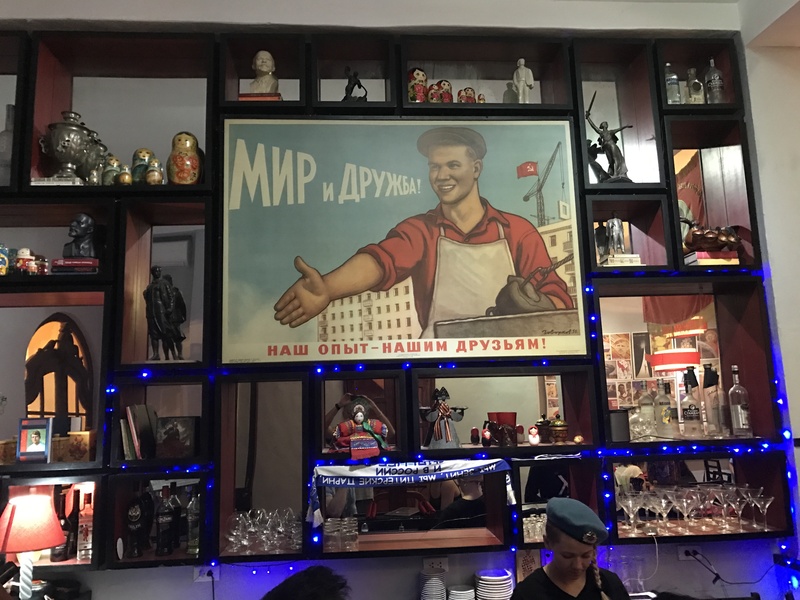 It was surreal to be sitting in a Soviet-themed restaurant, surrounded by flags and posters of what used to be the maximum bad guys, in Cuba. 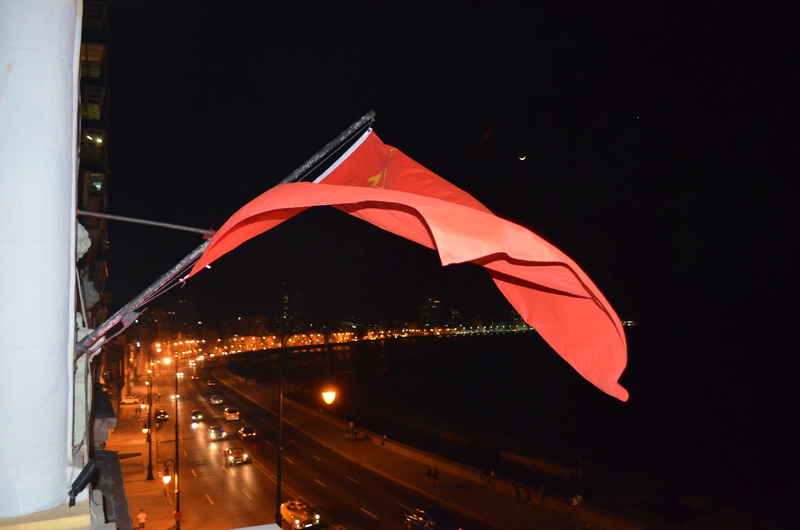 Seeing the hammer-and-sickle flying outside was weird. Luckily, we were able to apply some good old American ingenuity. Also, I believe that more restaurants should have party hats for their guests. This was a great touch. Once we’d finished our sardelki, we went back to El President and Ján, the owner, greeted us warmly and treated us like kings. 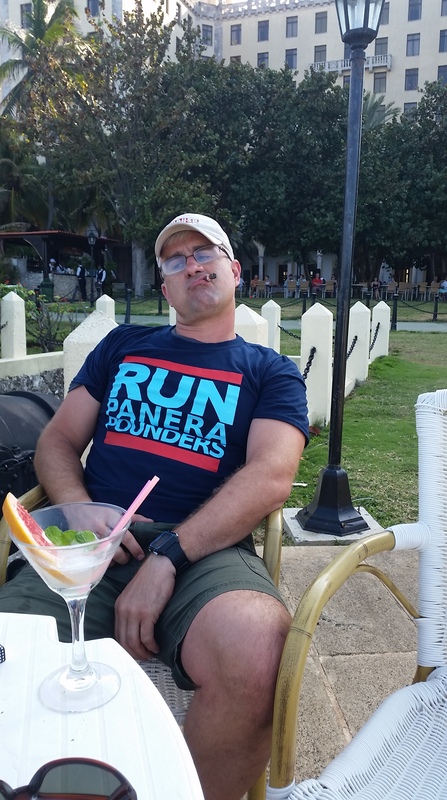 He spent probably 3 hours with us, explaining life in Cuba as an expat business owner. 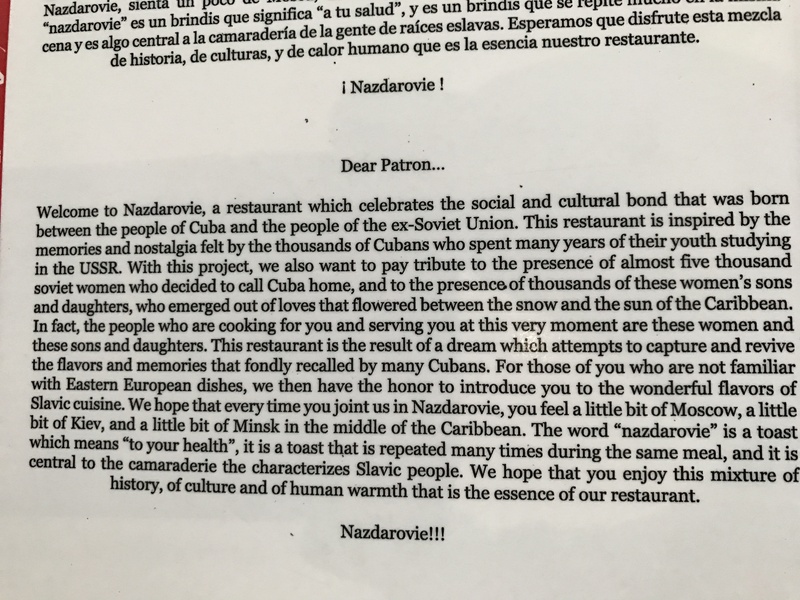 Raised in Slovakia and educated at the University of Oregon, his grandfather was a government official (there’s a picture of him with Castro in the restaurant), he had a unique perspective on Cuban life and culture. One of the many things we learned: toilet seats are very expensive, which is why so many public places don’t have them. Many people don’t have them in their homes because they’re costly, so they don’t mind not seeing them in restaurants, etc. (This leaves open the fascinating question of why they’re expensive, but none of us could come up with a plausible theory). 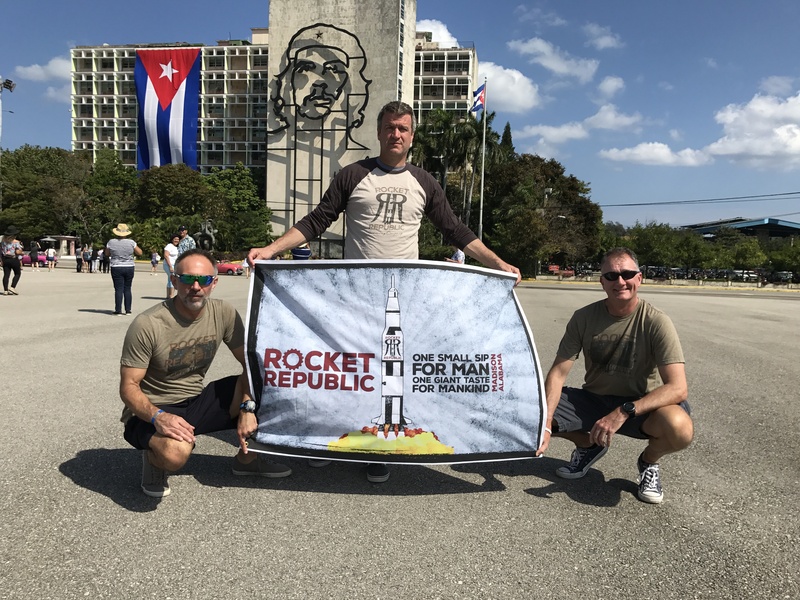 Ján told us all about the beer market in Cuba (there’s no draft beer) and we spent a good bit of time planning how Warren and the Rocket Republic team could exploit the untapped market. 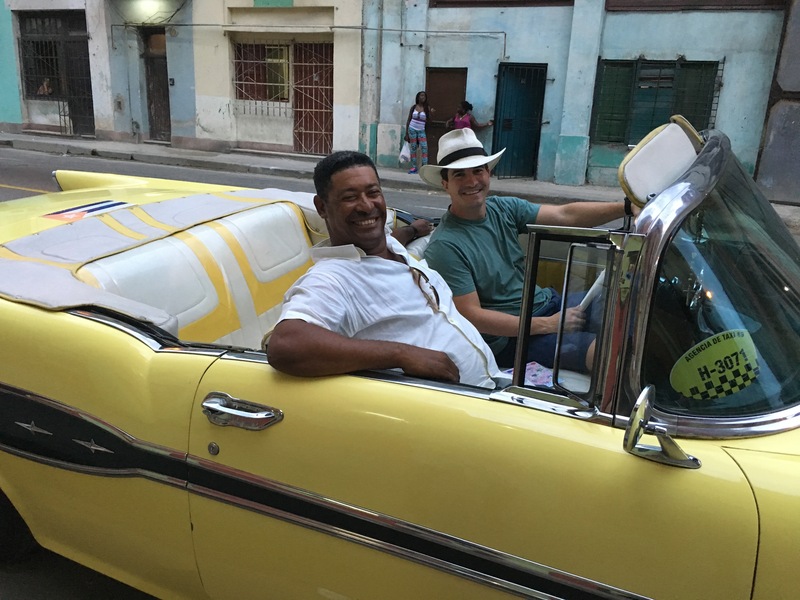 I would happily go back to Cuba just to hang out with him some more. Ján also spent some time explaining Cuban rum to us. It’s ubiquitous and cheap. His recommendations: Havana Club (sort of the Budweiser of rums) makes both dark and light rums that are good as mixers, with their higher-end 7- and 11-year rums (añejo, or mature) being better sipping rums. The best rum, he told us, was Mulate 15, but it’s around US $80/bottle. Instead, he suggested we try Cubay Añejo, and offered us each a free taste.. maybe half an ounce in a wide-mouthed glass. Summary: best. rum. EVER. 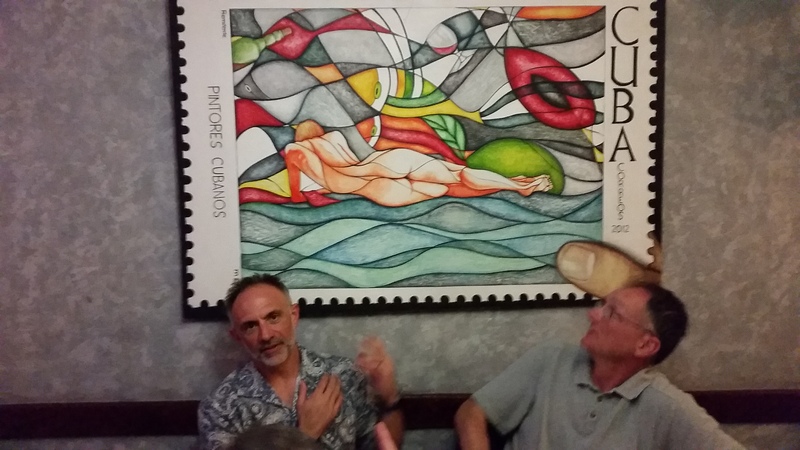 Sadly, the best thing about El Viejo was the art on the walls. 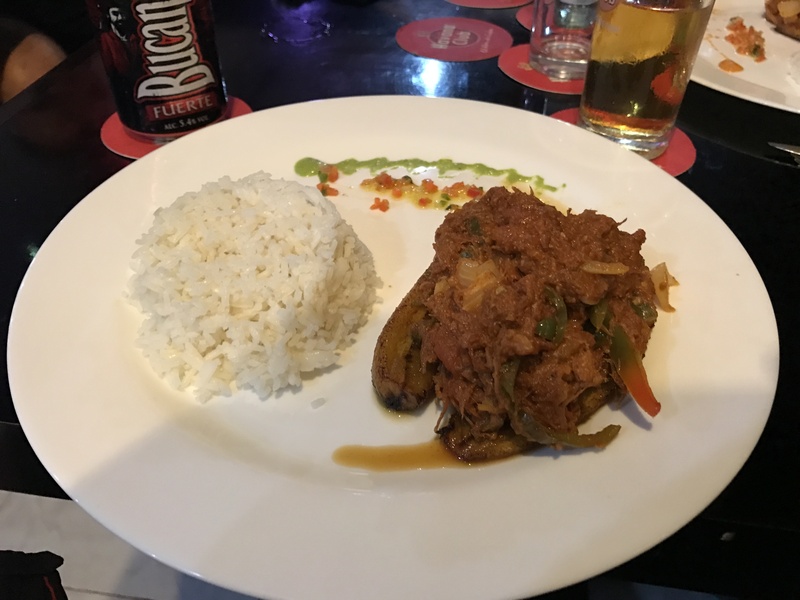 Well, overall, I suppose it was nicely decorated, and the staff was friendly, but it was expensive (CUC 17 for a mediocre ropa viejo, smaller and less tasty than the one at Kilometro Zero) and the service was extremely slow. They also added a mandatory 10% charge to the bill, just because they could, I suppose. By the time we finally finished dinner, it was around 1130p and I was worn out– so I headed back to the apartment while a separate delegation peeled off to go bar hopping. Day 5 should be subtitled “roaring back” because it was the first day where I felt like my normal self: energetic and ready to explore. I woke up feeling rested and starving so once the rest of the posse was ready, we headed back to Parque Central for another breakfast. This time I got my 15 CUC worth.. an omelet, brioche, cheese, ham, a piece of pie, more Cuban coffee, fruit, fresh orange juice– I feel like Homer Simpson just thinking about it. On the way there, we enjoyed a gorgeous walk up the sunlit Prado. Since it was Monday, school was in session and we saw a group of kids having their PE class, practicing the long jump. Combined with the rest of the pedestrians and tourists, this added a nice dash of energy to go along with the greenery. 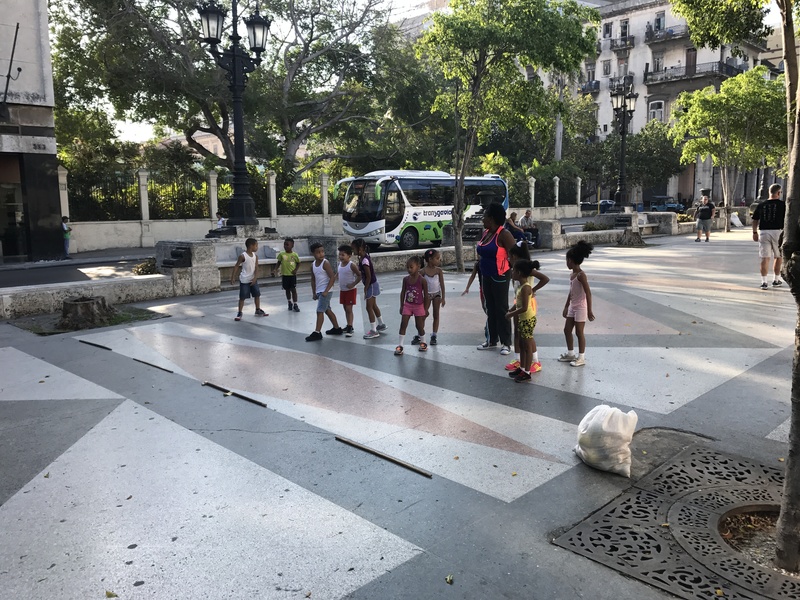 We’d planned for this day to be our first real sightseeing day, and right after breakfast we set out for one of the major city landmarks: Plaza de la Revolución and the José Martí Memorial tower. 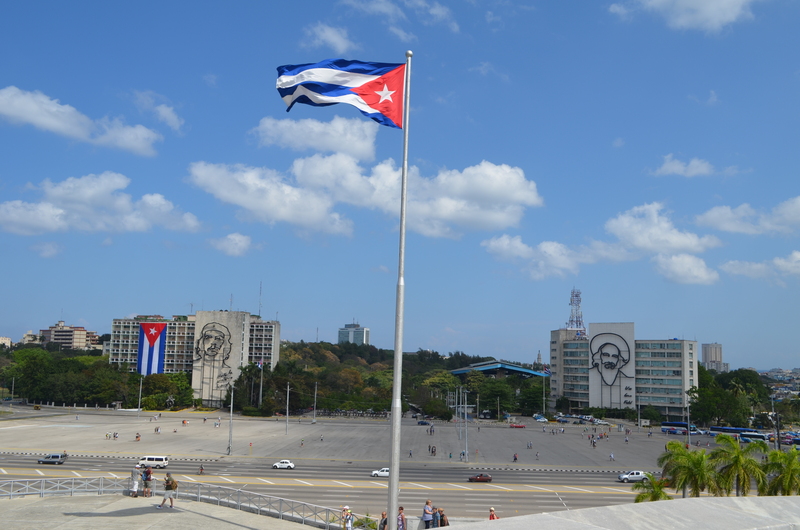 The plaza is a very large open area, formerly used for massive rallies when Fidel spoke. It looked strangely empty even though there were a fair number of tourists moving around. 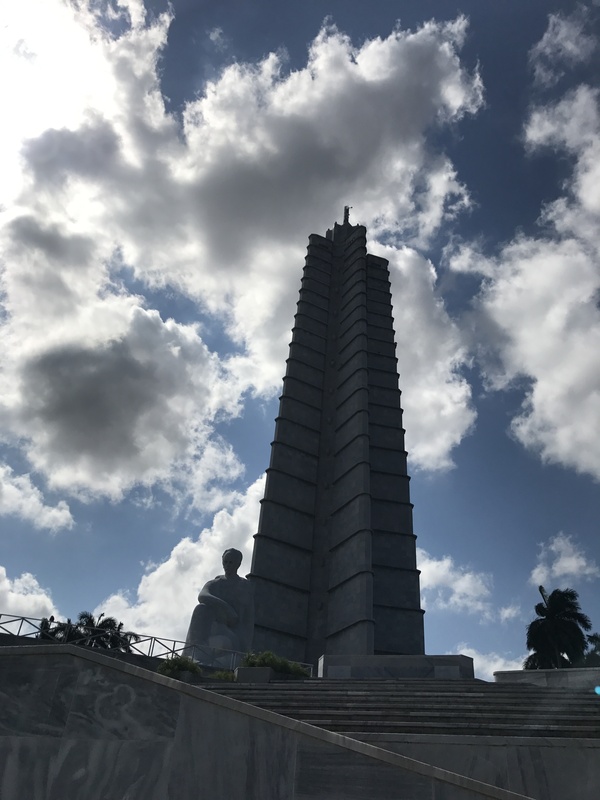 The Martí memorial is an impressive-looking stone-clad tower with a statue of Martí at its base. The tower looks like it’s swaying when you look directly up at it, which is a little bizarre. 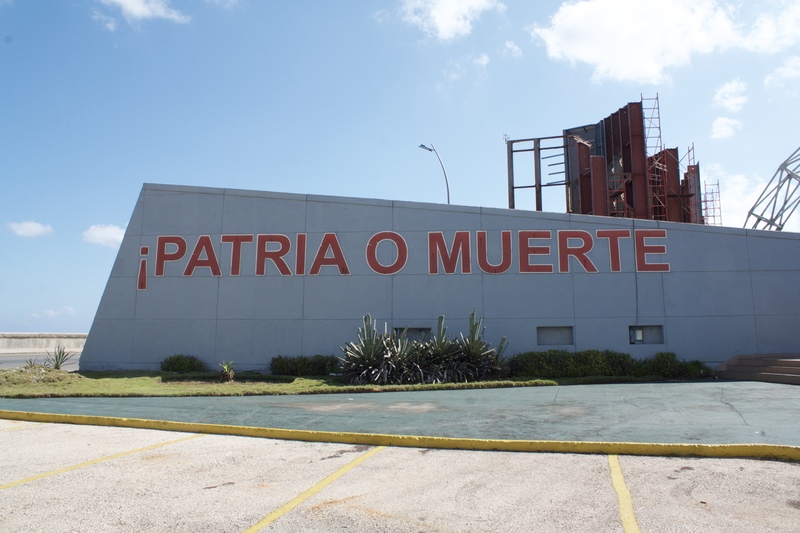 There’s a small museum in the base of the tower, with no air conditioning and a few desultory exhibits about Martí. For 2 CUC you can take an elevator to the top of the tower, which has two noteworthy features: observation windows and air conditioning. 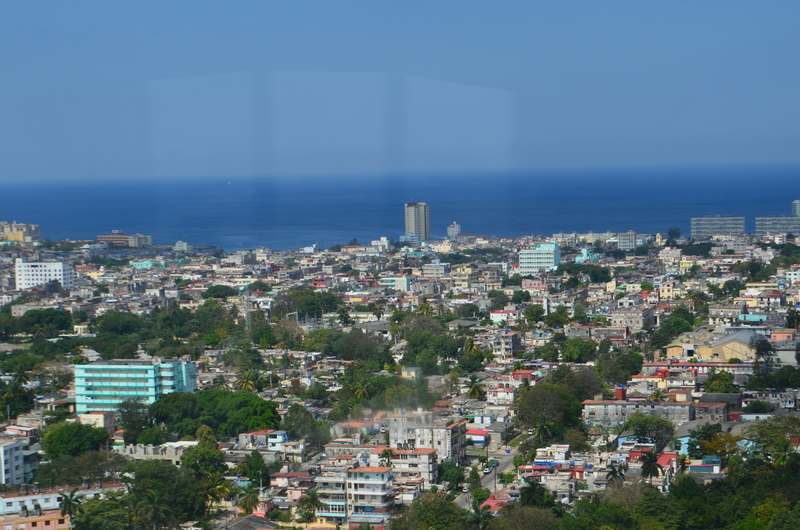 From that vantage point, you can see all of Havana and a good bit of the surrounding countryside. After a bit of effort I was able to capture a picture of this bird, whatever it was, which was flying around the top of the tower. Perhaps it was a DGI surveillance bird, checking up on tourists? Che, there’s a bird on your face! We decided to have lunch and drinks at El Presidente, a restaurant and bar about a block from the apartment. Their daquiris are excellent, and I recommend them highly. Their food? Not so much. I ordered crepes with ice cream; they were out of ice cream, and the crepes themselves were rubbery and tasteless. However, the water views and the hilarity of Warren trying to speak Spanish to the waitress made up for it. We walked back over to the Parque Central to grab some wifi. 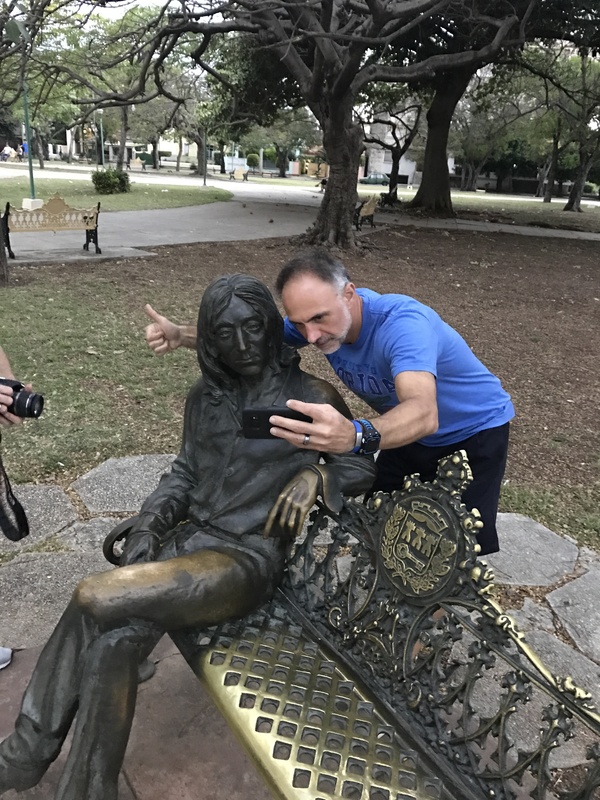 Julio wanted to go to Parque Lennon, named after John Lennon, so we grabbed a classic car and headed out for the 20-minute drive there. The park itself was pretty interesting. 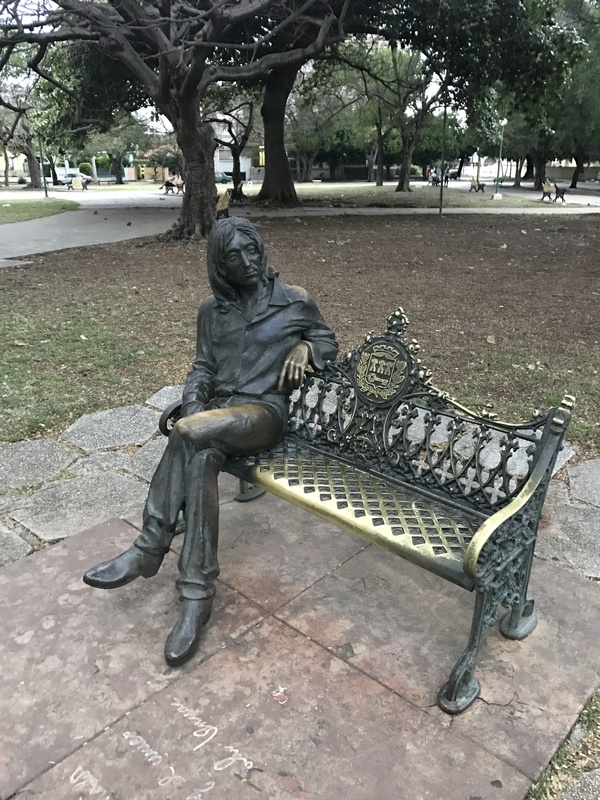 Its main salient feature is a bench with a lifesize bronze of Lennon. Other than that, it’s unremarkable– a nice city park with some open areas for kids to play soccer, a concrete bandstand/podium, and some trees. 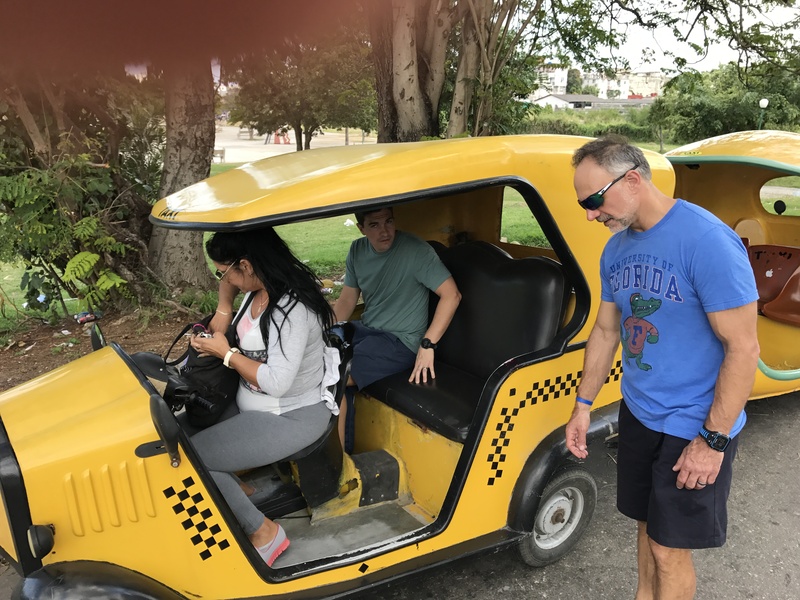 The best part of this outing was our cab driver– he was super friendly and personable and made the drive fun by (loudly) playing Cuban music on his (excellent) stereo. After everyone had time to chill at the apartment for a bit, we headed out for dinner. Tony had suggested a place for which we couldn’t get reservations (I wish I’d written down its name). 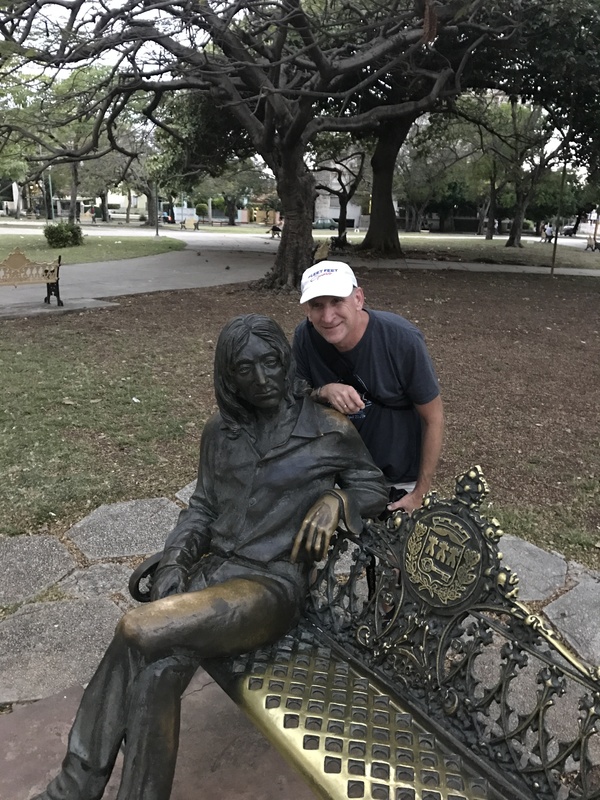 We wandered aimlessly around, stopping by El Floridita (too many lines) in search of someplace to eat, then we stumbled across a place Tony had mentioned earlier: Kilometro Zero. 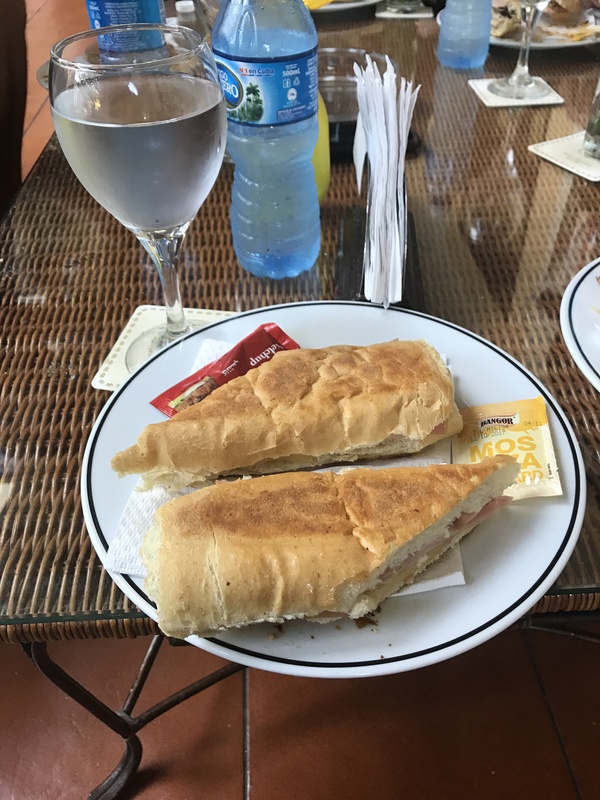 With live Cuban music, and superb food, this was one of the high points of my dining on the trip. I got to try ropa vieja for the first time. It is, essentially, slow-cooked shredded beef with spices, but that doesn’t capture how good it is. I look forward to learning how to make it. Kilometro was pretty typical of the tourist-oriented places we ate– in appearance and decor, it would not have been out of place in most large US cities. 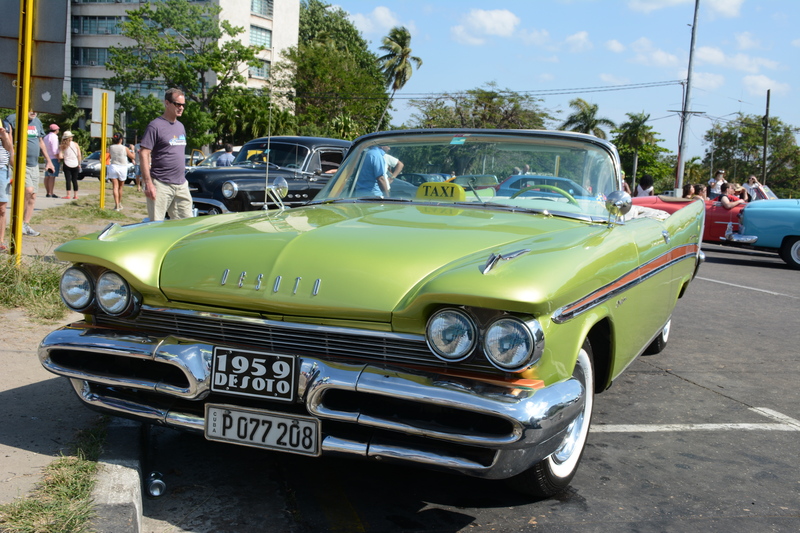 The menu and service are what made it Cuban… and oh, that ropa! I am still thinking about how good it was. Dinner took a long time, so afterwards, I headed back to the apartment to get some sleep. 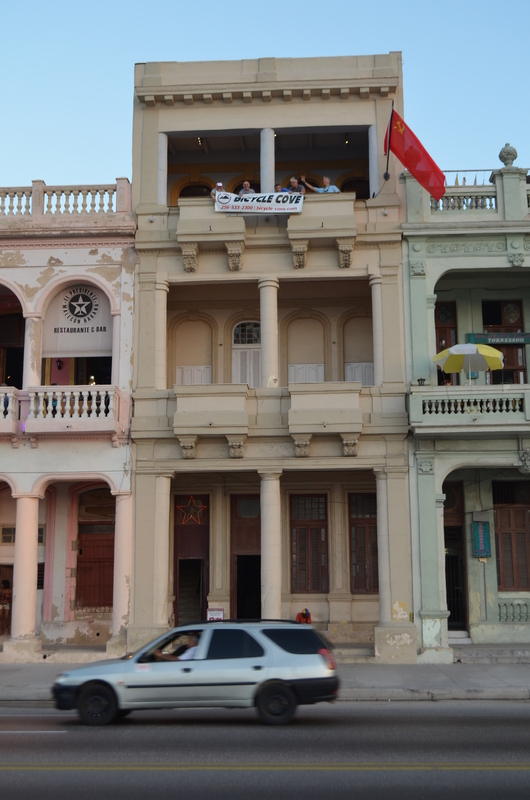 As usual, the Prado was semi-crowded, mostly with people camping out on benches using the available wifi… a uniquely Cuban sight. I woke up the day after the race still feeling like a pile of garbage. “I didn’t eat much yesterday,” I reasoned. “A good breakfast will fix me up.” With that happy thought in mind, we headed out to the Parque Central hotel, where our Airbnb host alleged we could get a delicious buffet for 15 CUC. US-issued debit and credit cards cannot be used. This is thanks to the US economic embargo. Cards issued by banks in other parts of the world work just fine. That means if you want money in Cuba, bring it with you, because you won’t be getting any while you’re there unless you use Western Union. As far as I can tell, no one in the US changes CUC. You can’t get it at the Atlanta airport or any of the online currency exchanges I found. 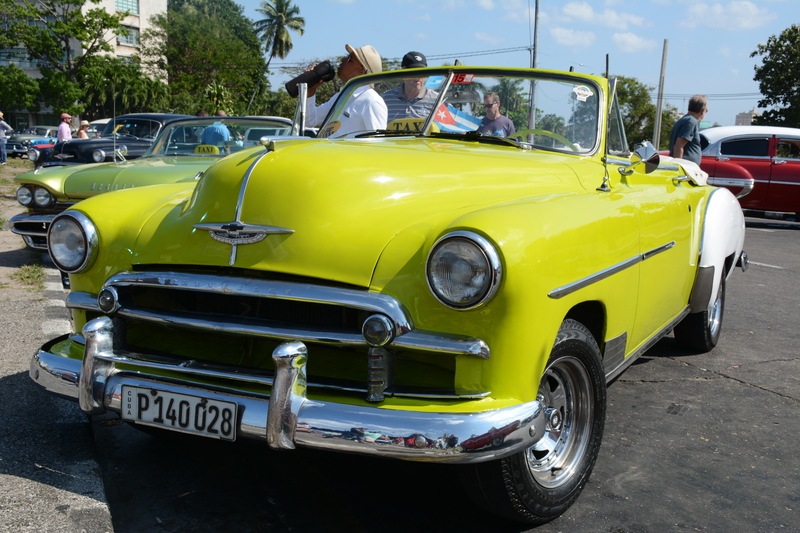 There are currency exchanges at the Havana airport but you’re better off finding one in town. Many hotels have them, but Eric took us straight to one inbound from the airport. There’s a 10% penalty when changing USD to CUC. In our case, we saved about 1.5% by buying Euros and then changing them to CUC after our arrival. However, when you change CUC back to USD, there’s no penalty. Prices for many things are quite low by US standards– you can get an excellent meal with drinks for 15 CUC, for example. However, hotel rooms and taxis are not particularly cheap, nor are cigars. 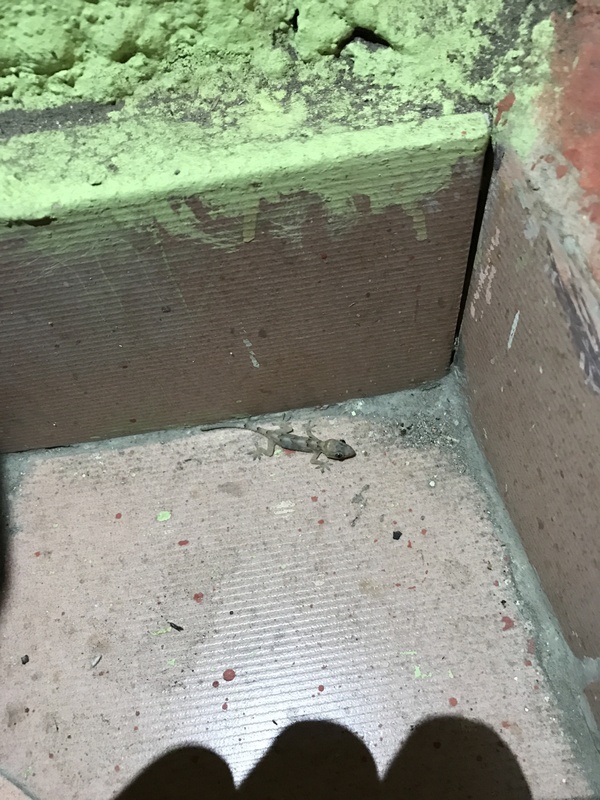 I found that I could comfortably get by on about 80 CUC/day for meals, transportation, and incidentals. That doesn’t include lodging. If you eat less, drink more, or do more tourist-y stuff your mileage may vary. Anyway, back to the buffet. The other guys all loaded up huge plates with omelets, ham, pastries of various sorts, and all kinds of other goodies. I picked at a hard-boiled egg, a couple of pieces of ham, and a roll… I just wasn’t hungry and was still feeling queasy and dizzy. 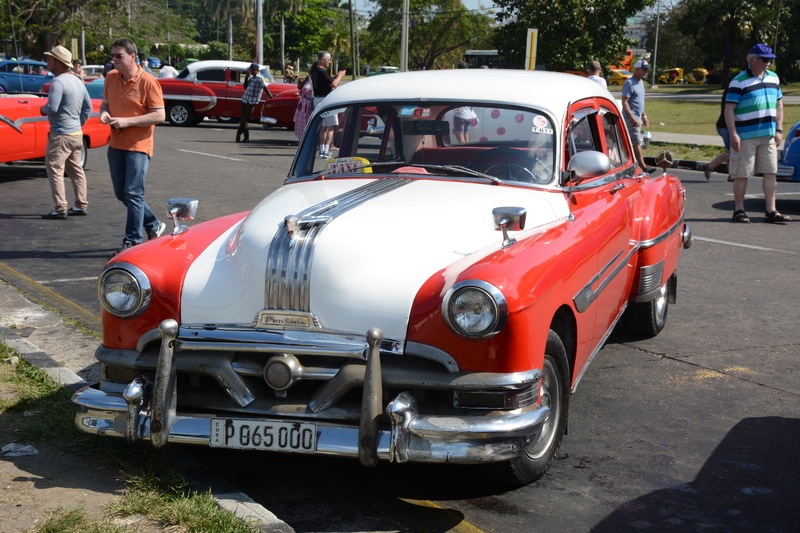 Despite that, the two very strong cups of Cuban coffee I had were quite welcome. 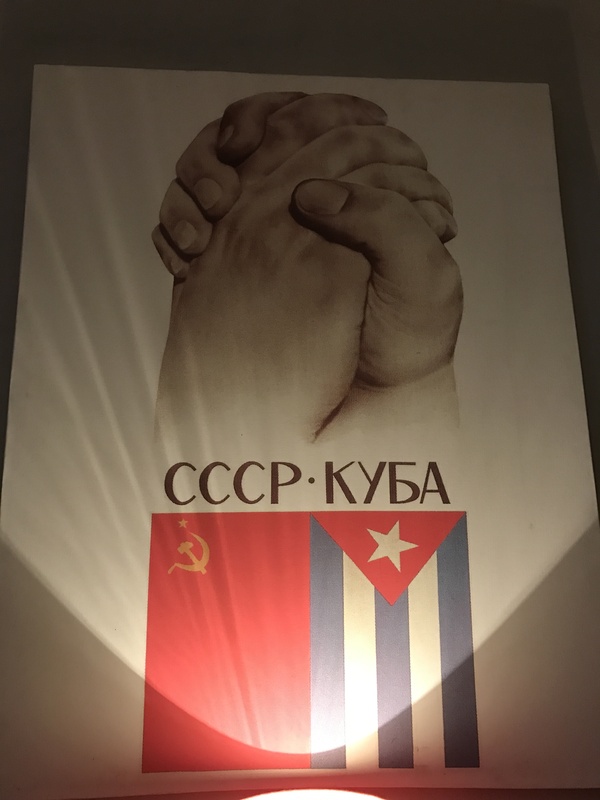 Our next stop was Museo de la Revolución. Napoleon’s aphorism that history is written by the winners was clearly the inspiration for this museum, which is just as propaganda-heavy as you might expect. 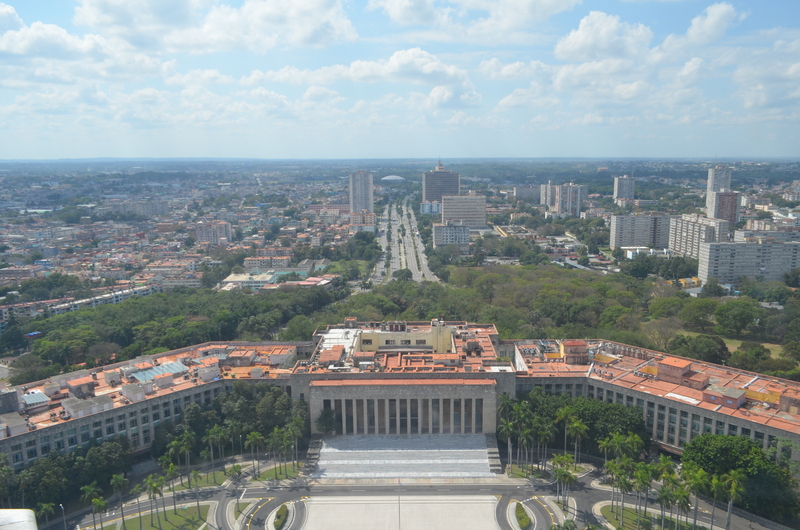 It’s housed in the former Presidential Palace, and many of the original furnishings and decorations are intact, as are the bullet holes generated by the armed band of students who attacked the palace as part of the Cuban revolution. As you might expect, the exhibits focus heavily on the revolution and its aftermath. 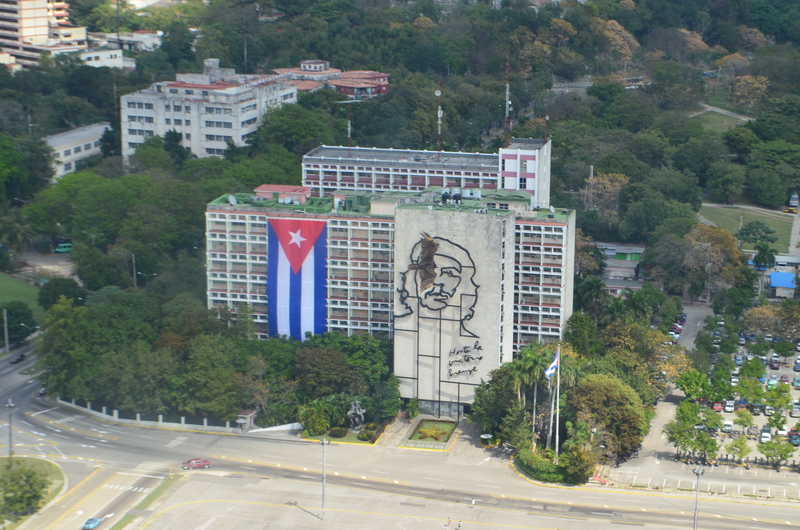 Fidel Castro and Che Guevara are extremely prominent; Camilo Cienfuegos, who was really the true military mastermind behind the revolutionary army, gets relatively short shrift. 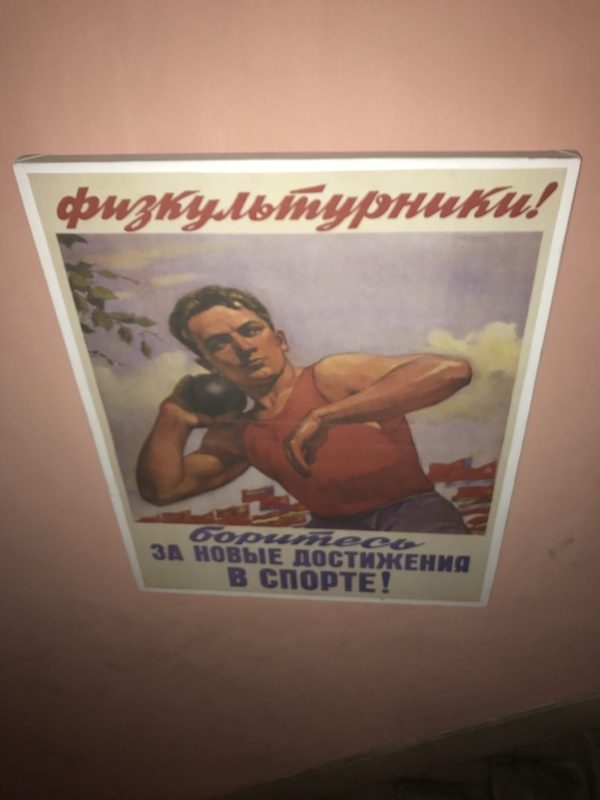 I learned that he died in a mysterious airplane accident in 1958, shortly after the revolution. The exhibits are all labeled in Spanish but only a few have English translations, and those are mostly poor in quality and too brief to accurately capture the detail of the Spanish versions. 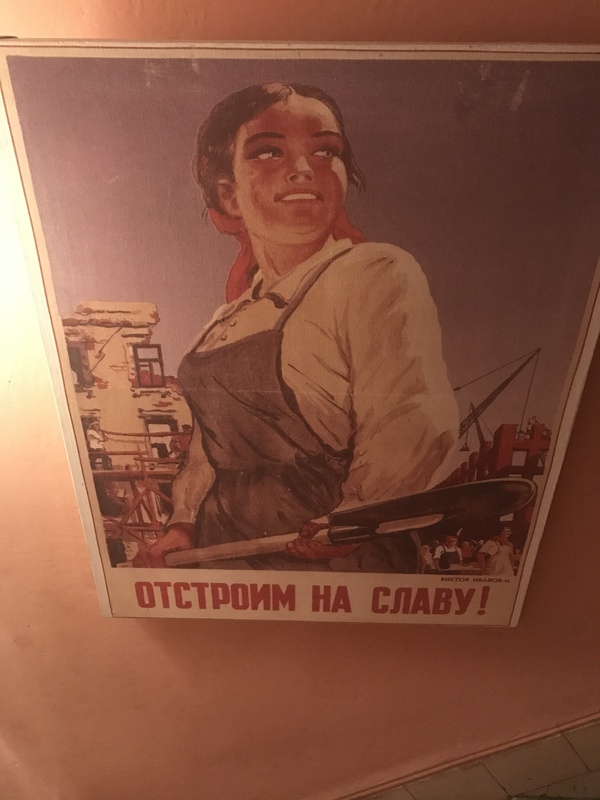 Sometimes the propaganda quality was just over the top– the “Corner of Cretins” is a good example. The small plaques thank each cretin (Batista is the fourth, off to the left) for various things. The entry for George H.W. Bush says “Thank you cretin for helped us TO CONSOLIDATE THE REVOLUTION.” I mean, come on, guys, at least get someone who can conjugate verbs to help you write your insults! Interestingly, the museum itself contains three small shops selling random tourist crap. Not very revolutionary. After the museum, I skipped lunch and went back to the apartment for a badly needed nap. When I awoke, everyone else had made it back and we all spent time washing our race stuff and hanging it to dry on the terrace. 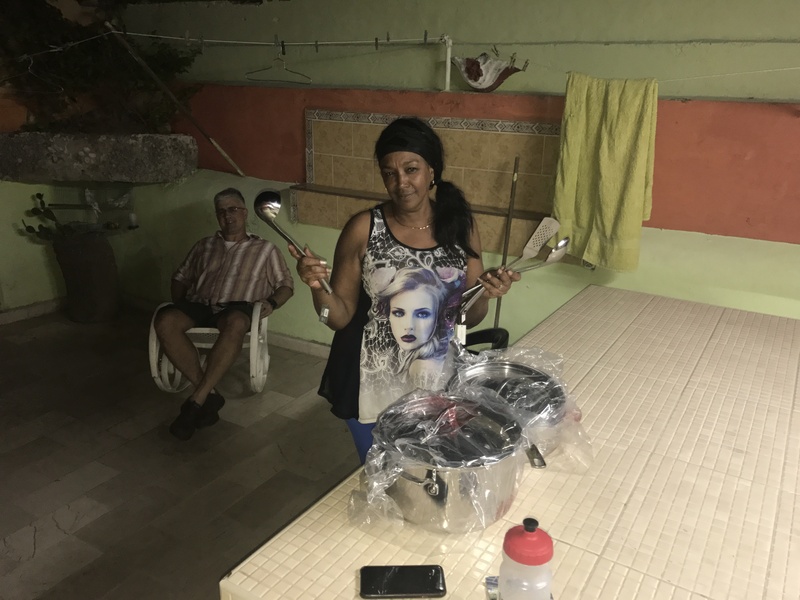 While this was going on, Anita, our housekeeper, and her friend Rita were cooking us a Cuban dinner of slow-cooked chicken stew with pineapple, rice and beans, salad, and fried plantains. 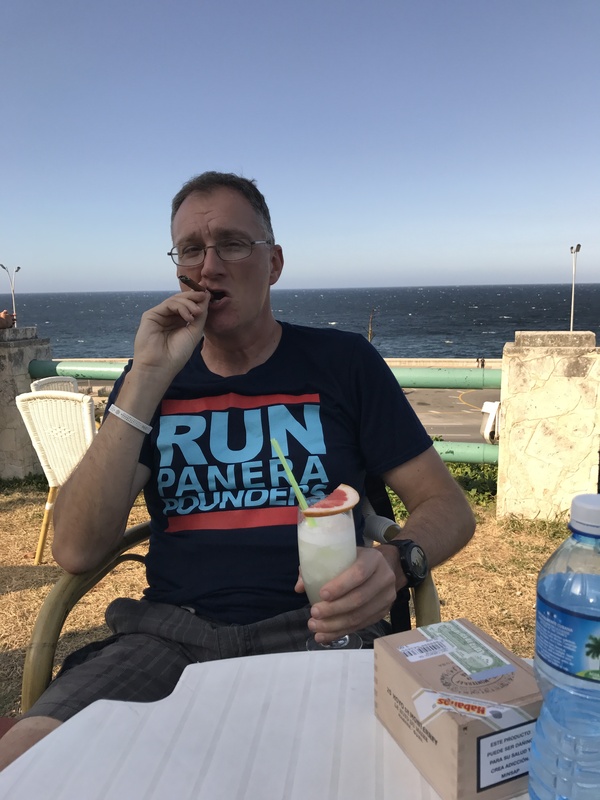 It’s true, I was very hungry at this point, but I have to say that this was the best meal I had while in Cuba, and one of the best I’ve ever had anywhere. The chicken was tender and flawlessly seasoned; the pineapple was naturally sweet, slightly caramelized, and a bit spicy from being cooked with the chicken, and the beans were perfectly cooked and seasoned. I had 3 plates worth and then had to quit before I damaged anything. 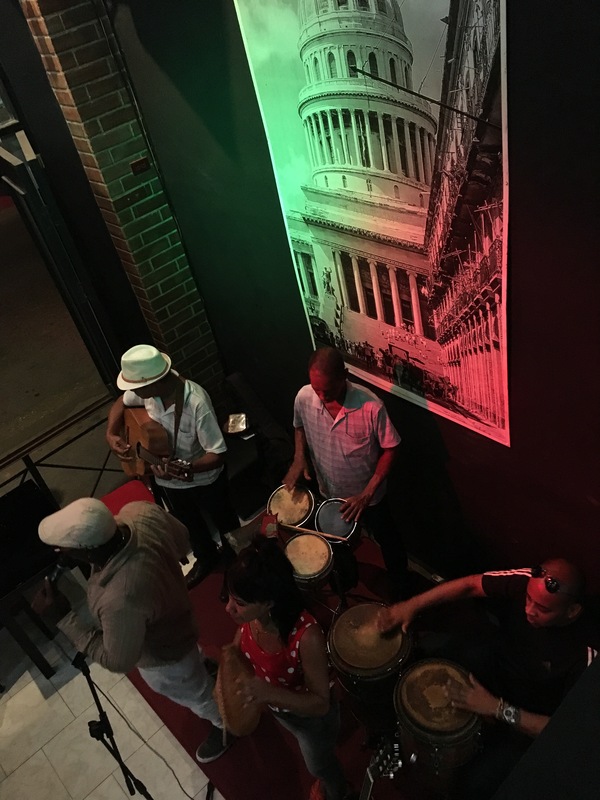 Our plan for the night was to go to FAC– Fábrica de Arte Cubano, basically a super-powered art gallery and party space. It’s only open Thursday through Sunday from 8p to 3a, so this was our last chance to go. We wanted to have drinks on the rooftop bar at El Cocinero, which is next door. However, when we arrived, we found the bar closed due to plumbing problems. That turned out to be OK; we got in line about 715 but by 730 the line was down the street and around the corner. FAC admits only 800 people each night, so if you don’t get there early, you might not get in. We stood in line chatting with other visitors, including a couple from Montreal who told a funny story. 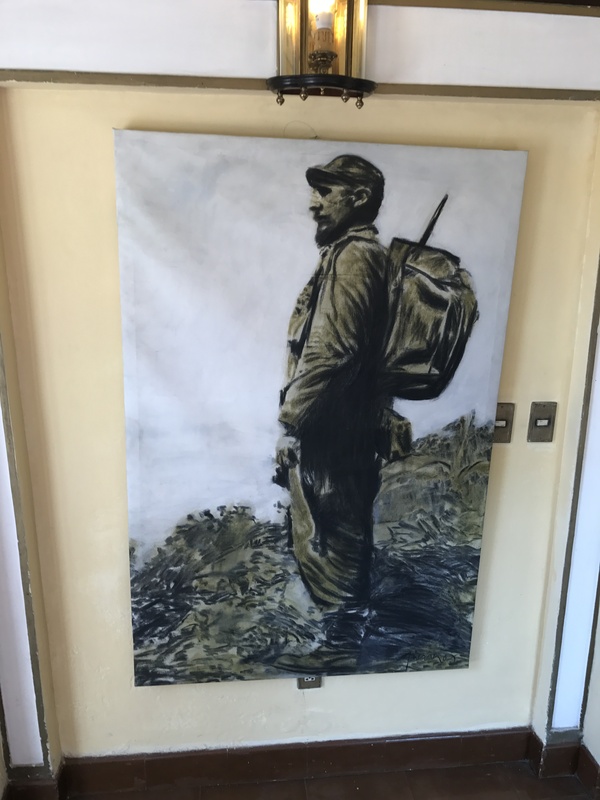 They were staying at an Airbnb owned by a Canadian and his Cuban boyfriend. 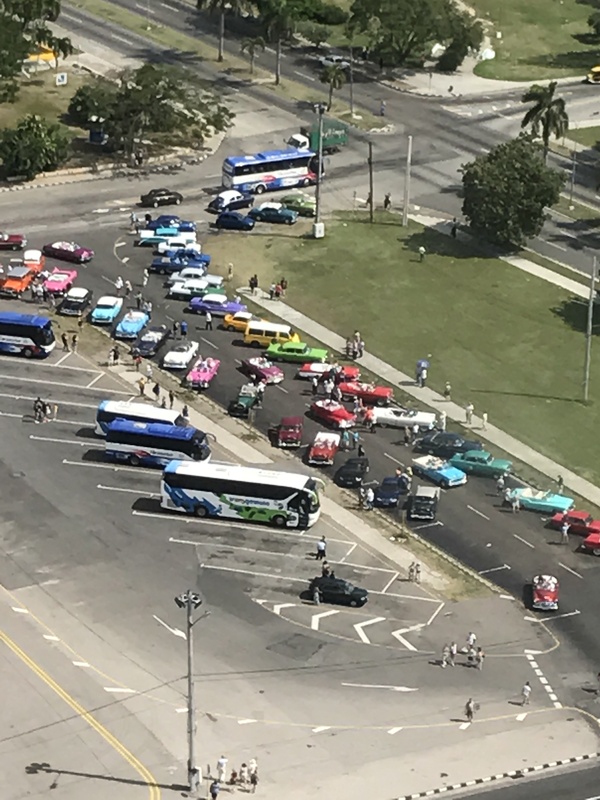 Non-citizens can’t legally own real estate in Cuba though, and of course the Cuban government doesn’t permit gay marriage. How was that possible, I asked? “Oh,” laughed the Canadienne. “The Canadian married his boyfriend’s mother, and the apartment is in their names.” Nice workaround! We paid 2 CUC for admission and got drink cards– to buy a drink, you show your card and the bartender marks it, then you provide your card at the exit to pay your tab. (Lose your card and it’s 30 CUC!) There are six or seven bars inside FAC, along with a large performance space, a video gallery, and wall after wall of art exhibits. The best way I can describe the overall vibe: noisy crowds of tourist hipsters. I’m not really an art person, and I tend to walk through art museums at a pretty brisk clip, so I didn’t really see anything that made a huge impression on me. (There was a nice gallery of small pictures of zebras chasing laser pointers, though.) The big attraction was being able to sit outside on the roof in the warm Cuban air talking with my friends and hipster-watching, but eventually I started getting more and more tired and decided to punch out and head back to the apartment. I was awake for maybe 15 minutes once I got there– and getting there was an adventure, not because of the taxi we took (which was fine) but because of the stairs! My quads were still trashed from the previous day’s race and so I couldn’t make it up even half a flight of steep Cuban stairs without having to stop to catch my breath. Humbling.